Relax under the crisp canopy of tall trees; inhale the smell of the earth after the rain, or just let cool breezes blow your hair all day. 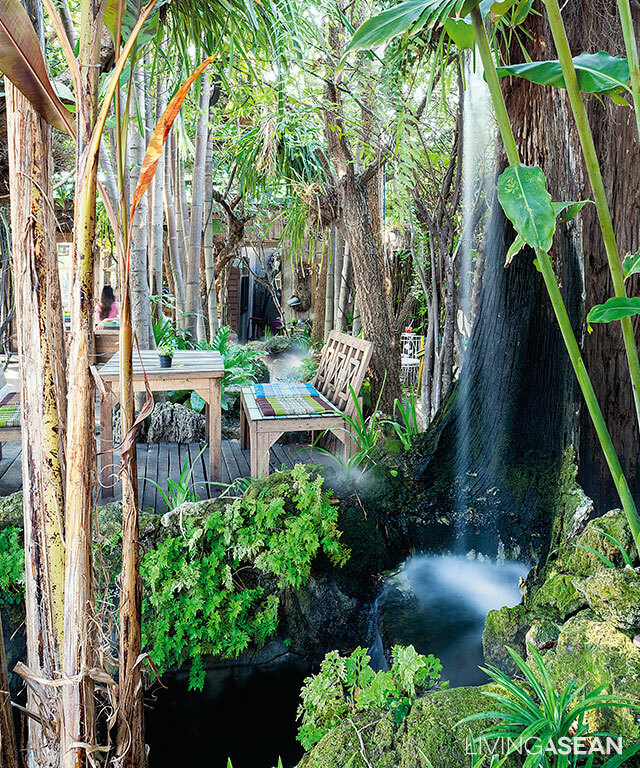 That’s exactly the atmosphere inside this beautiful tropical garden. 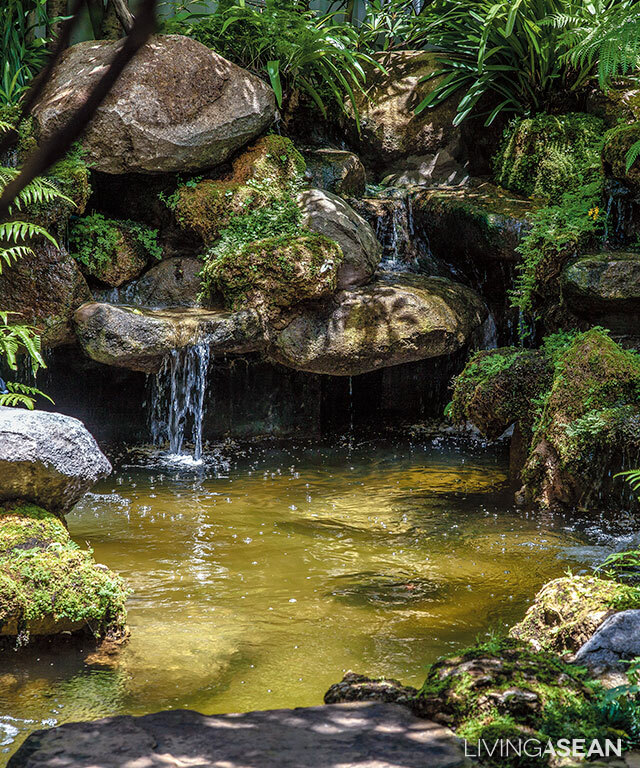 Water cascading down the faces of rock formations fills the garden atmosphere with sweet, soothing sounds. 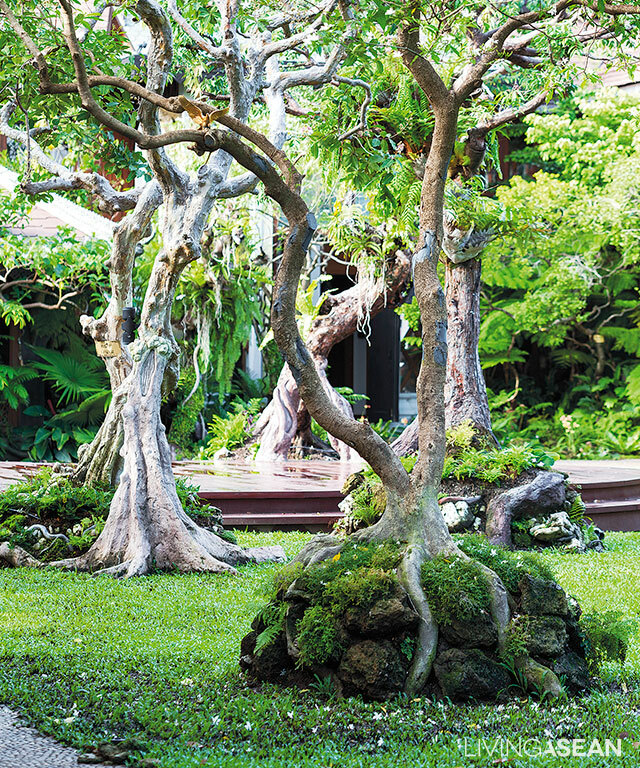 The cliff faces are bedecked with a rich array of green vegetation such as fern and moss and reclining trees. 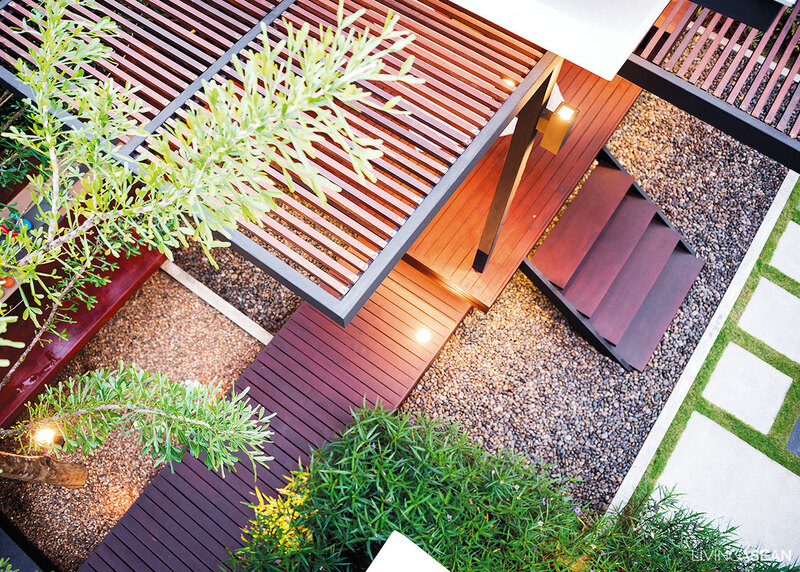 Walkways are built close to the exterior walls for ease of maintenance. 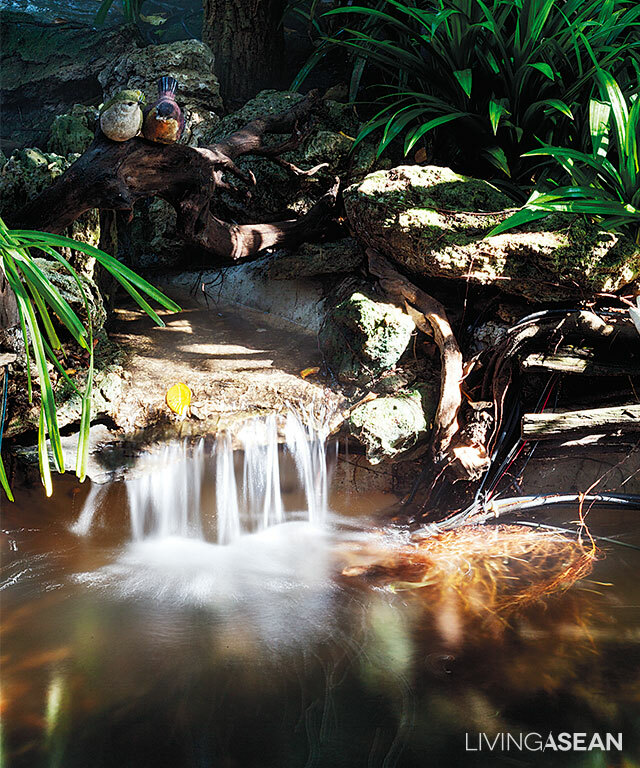 Small streams meander past various attractions on the “forest” floor. Tributaries at the very top of the fall are designed to mimic those found in natural forests. From here small streams meander through rock formations, rapids, and tree trunks to form a big waterfall. 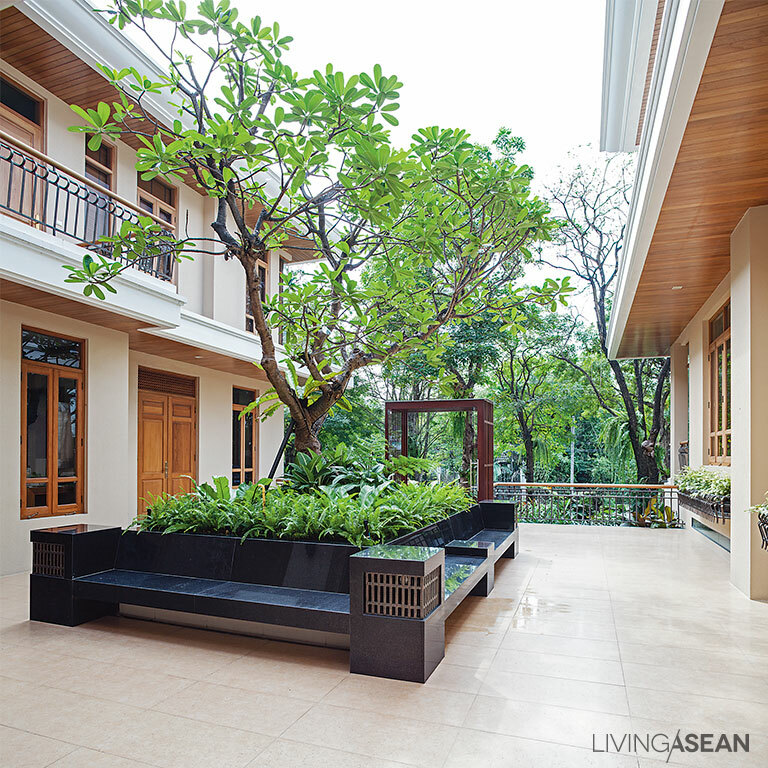 /// A sitting area on the reception hall terrace is the favorite spot where the owner stays in touch with natural environs. “Firstly, we started out with the hardscape. We sought the owner’s consent to turn a gazebo into a reception hall with more functions. 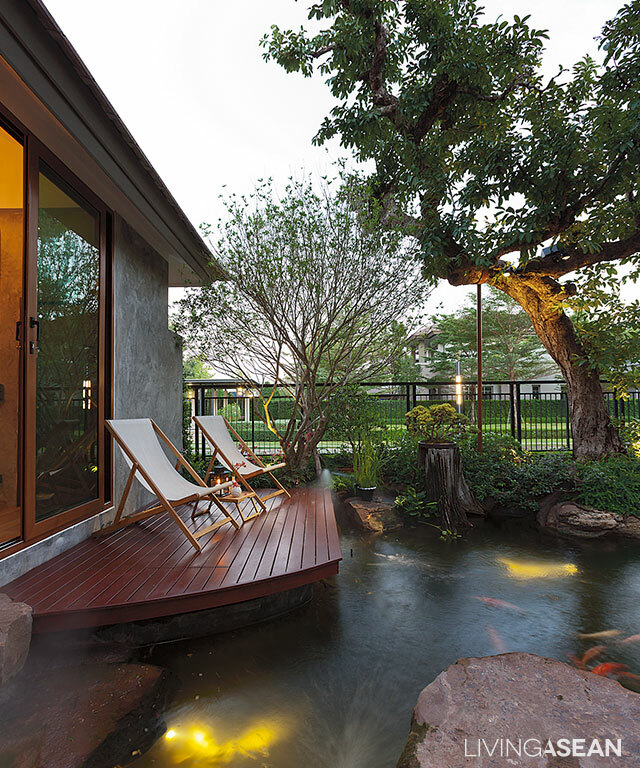 Then we laid out passageways connecting all areas including the poolside, and all details as natural feeling. A reception hall is nestled in the mid of lush green scenery. 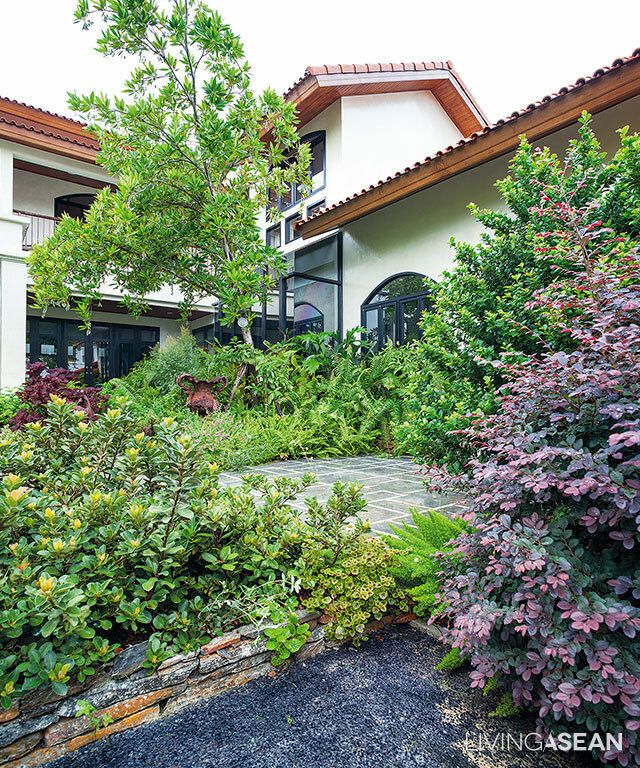 It is a relaxing, wholesome destination on the property. The reception hall, as seen from another perspective, is bedecked with artificial free-form rock formations that line the water’s edge. 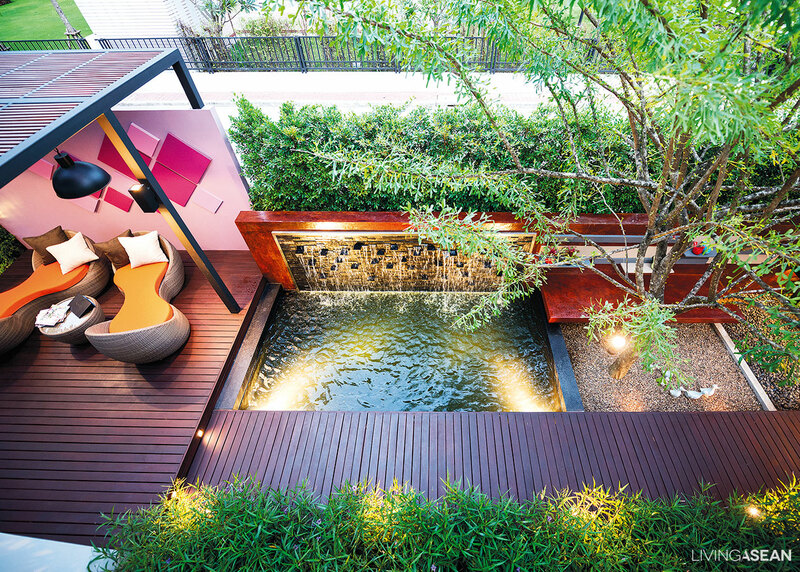 “The waterfall is the highlight of this garden. It starts with small tributaries cascading from the top. They soon come together to form a confluence before tumbling down into a receiving pond below. By design, the main fall is seen from the reception hall. 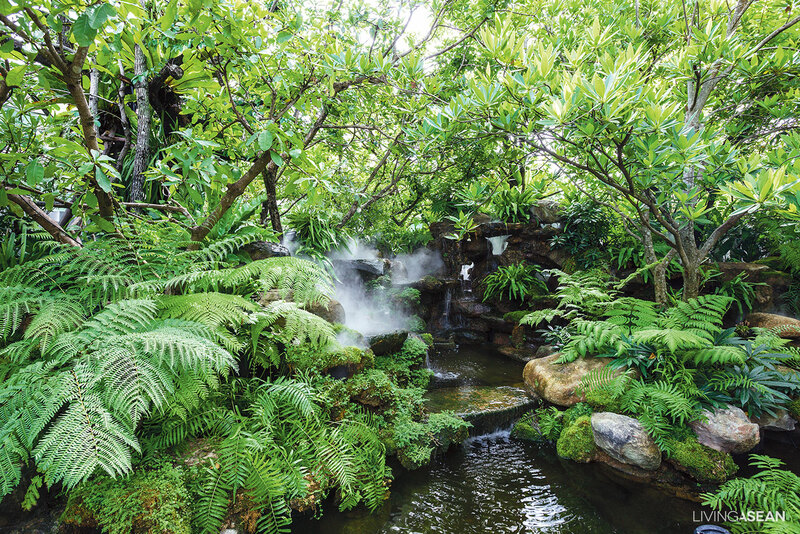 All the while, the salubrious atmosphere is filled with mellifluous sounds of water hitting the misty pond. And we plant the big trees first followed by mid-sized ones. 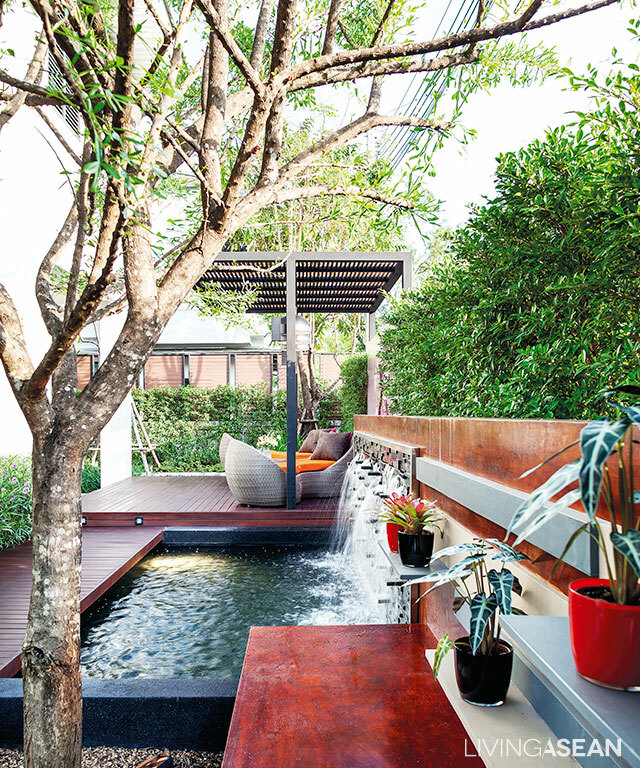 Different heights evoke images of natural forests that coexist in perfect harmony with water features. 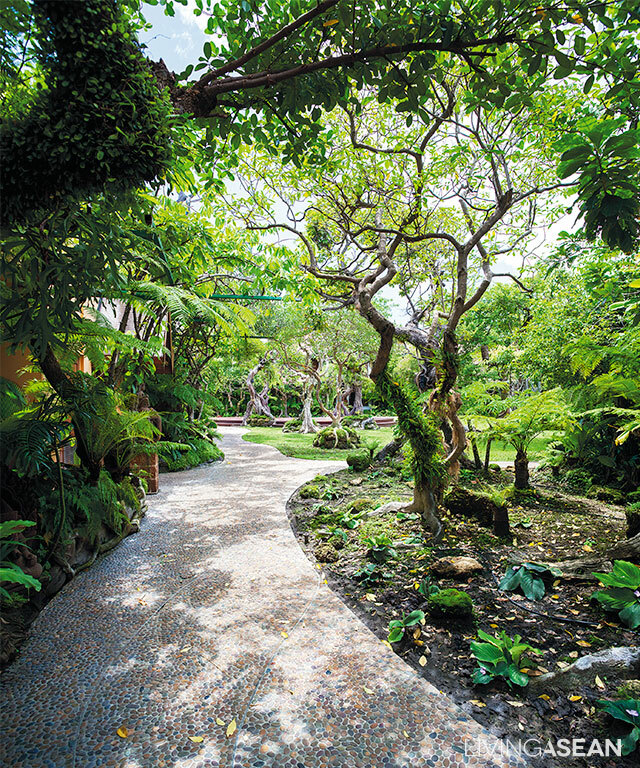 A lush green, refreshing atmosphere typical of a Tropical forest. 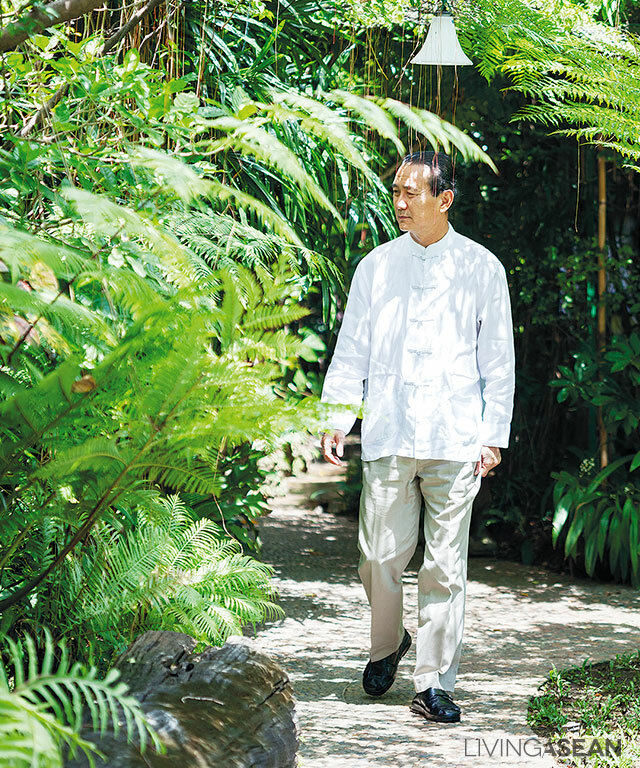 “Three kinds of plants are grown here – small, mid-sized, and tall. They mix and thrive the way nature intended. Some of them do not even straight but leaning sideway as if in real forests. 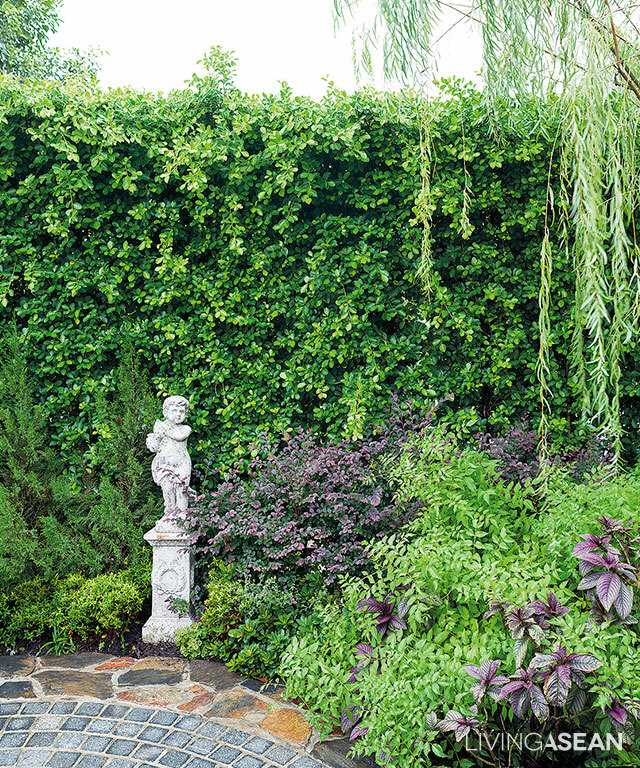 Mid-sized trees are good along the fence line, where they serve as privacy screens. 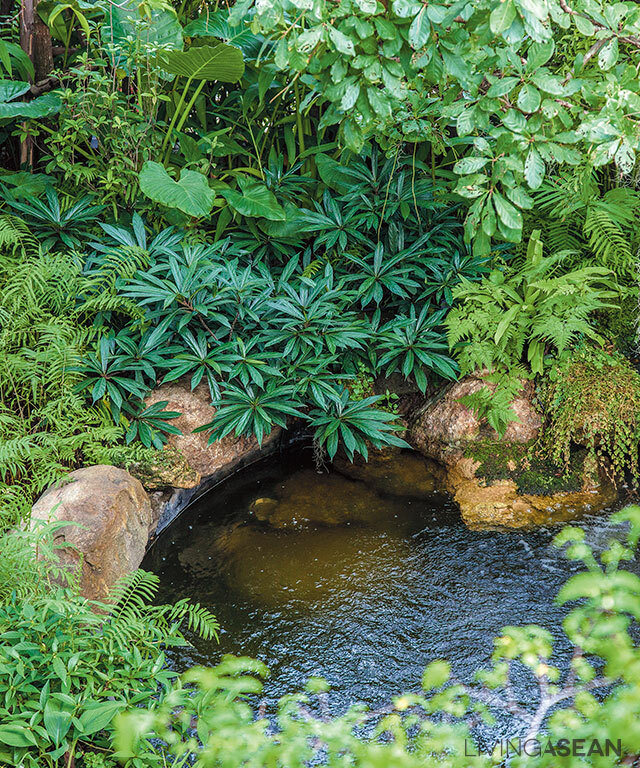 Fern is more suitable on the waterfall, where it thrives in symbiosis with other plants in the wild. For safety, we avoid using chemicals, be it insecticide or herbicide. 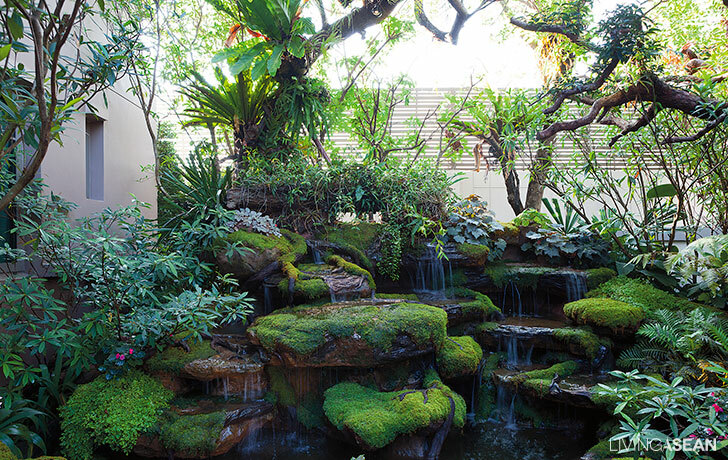 A mix of different trees, shrubs, and moss replicates the ecological system that is typical of a Tropical forest. 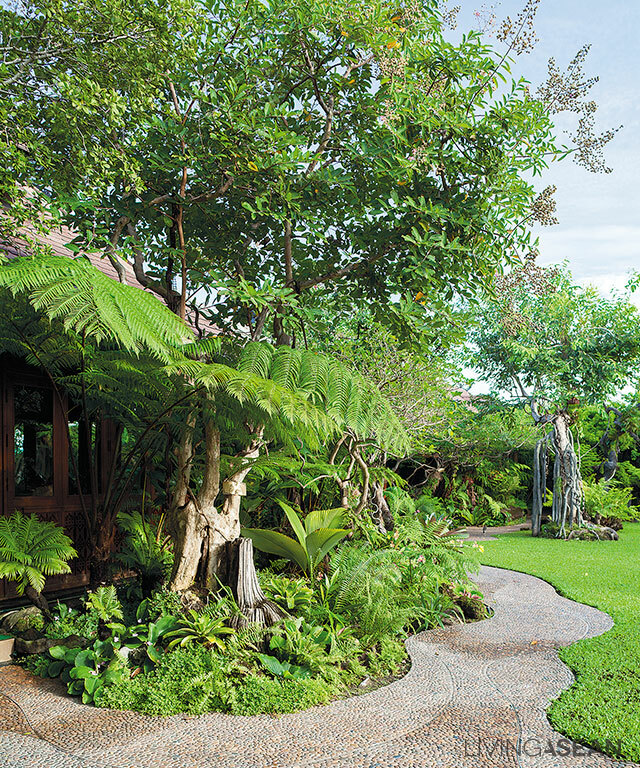 Fern adds a touch of nature and a vibrant atmosphere to the entire garden landscape. /// Siam tulip (cercuma alismatifolia) thrives alongside spike moss as if in the wild. 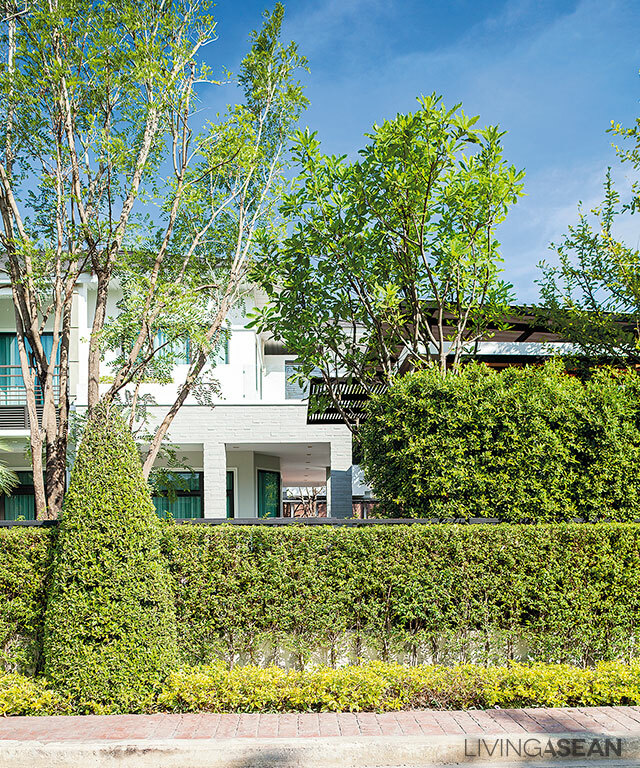 Welcome to another side of Phetchaburi Road. 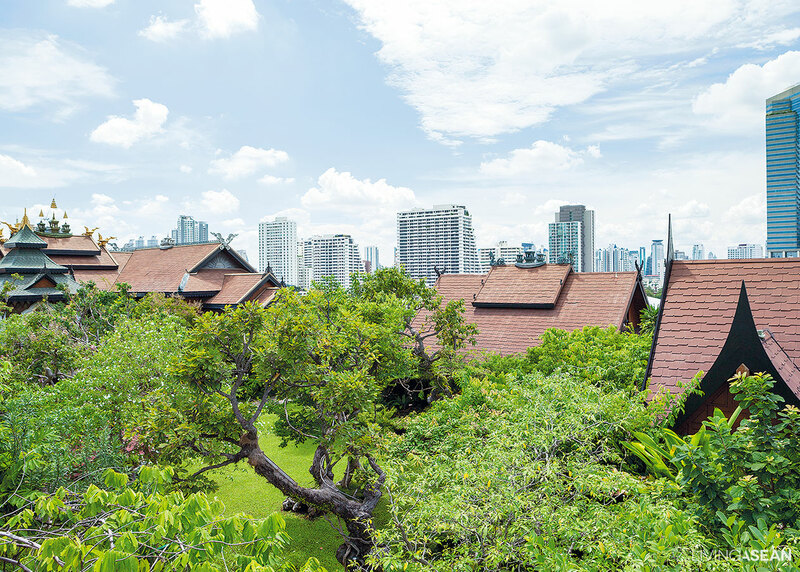 Leave traffic jam behind and step into the rooftop oasis garden of Vikrom Kromadit, the famous Thai author as well as creator and CEO of Amata Corporation. 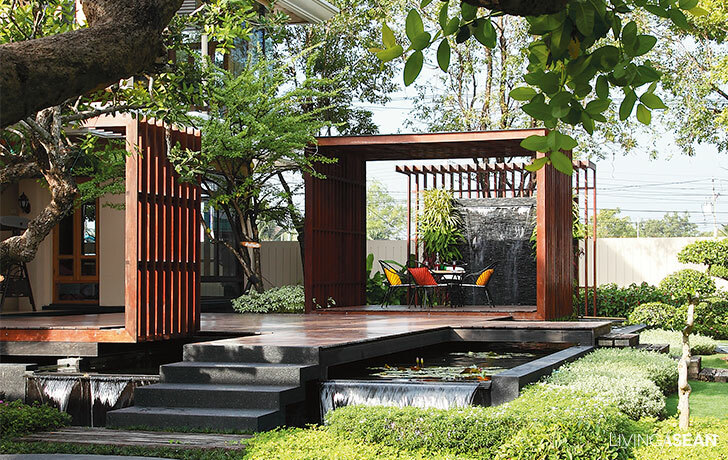 The concrete and river-pebble pathway winds around under native Thai trees such as gold apple, white sandalwood, and bauhinia standing among taller ones, with sweet fragrances of lignum vitae and gardenia wafting from dazzling blossoms on elegantly formed branches. 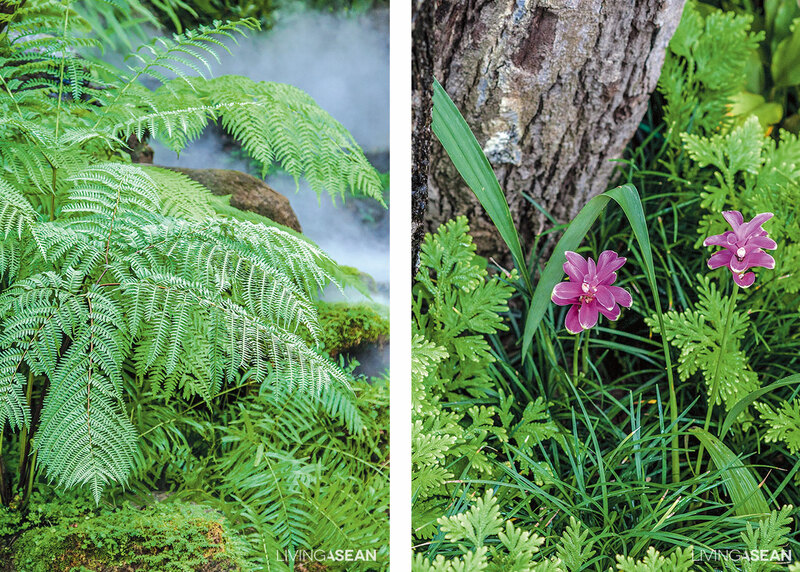 Nearer to the ground were ferns, arrowroot, konjac, elephant ear, ground orchid, bromeliads, and moss displayed verdant greens. 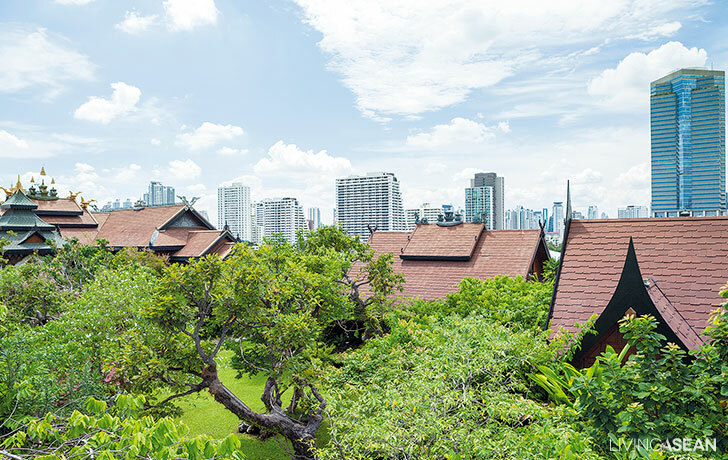 It’s unbelievable that this garden exists high on the rooftop of a big building in the heart of Bangkok. The soil is only about 15cm thick, so what secret techniques did they use to get this perfection? Vikrom tells us, “A garden isn’t something you create and are suddenly finished with. A garden is a living thing. This all happened in stages over 8 – 9 years. At first, we experimented. After we got moss and ferns growing well, we added a lot of improvements. By the time we had it looking good, we’d perfected our knowledge of cultivation and maintenance. The last stage has been the most enjoyable, but it’s all about constant change and adaptation. I walked around in admiration. This space of less than half an acre contains a waterfall, grass lawn, and a wooden deck that can hold 400 people and is used for various events. 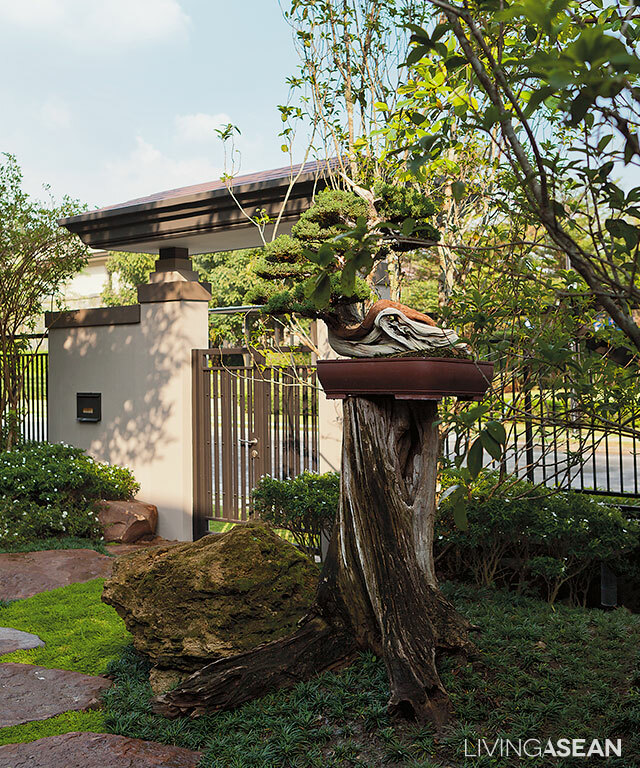 Birds and other creatures roam freely, a unique sight in the heart of the city. 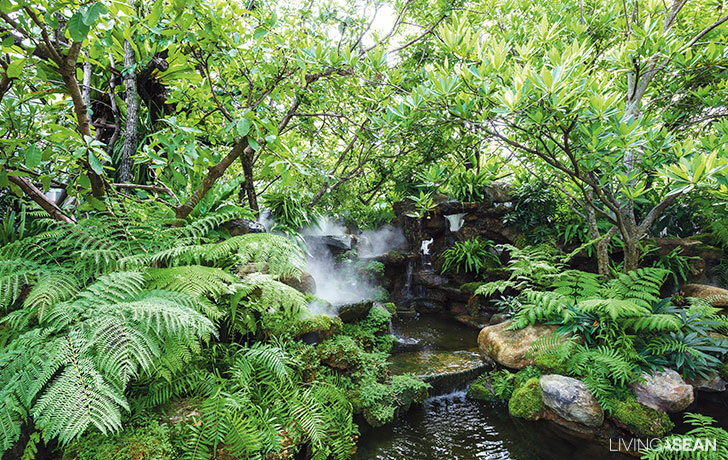 Saying this is heavenly is really not an exaggeration: it has the look of one of nature perfect jungle gardens. 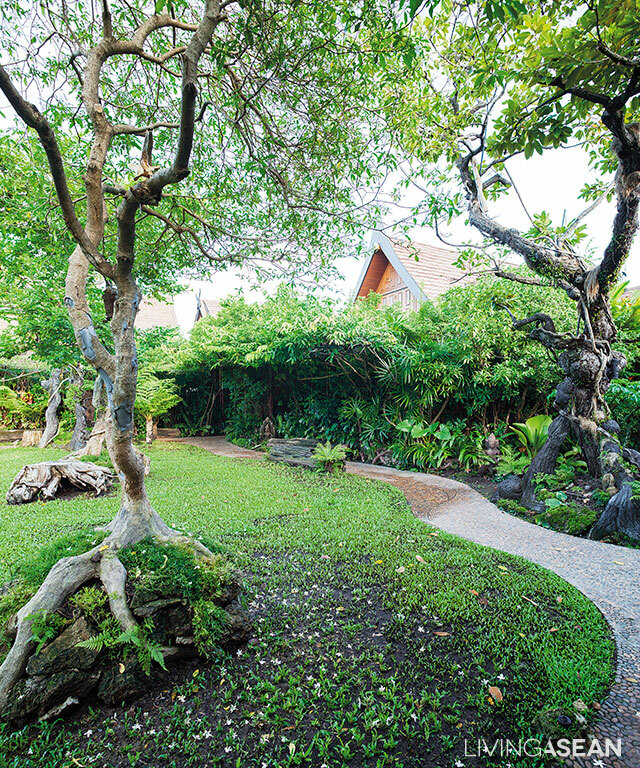 Clearly, the owner and creator here loves and understands nature and has created his own heaven, where all things live together in happiness. 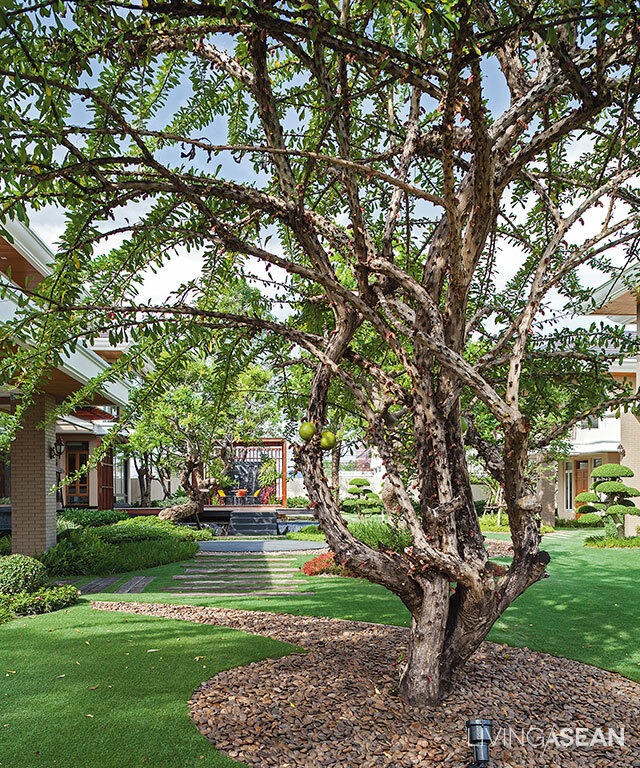 The gardening ideas of colorful flowers welcome guests to the garden of Thanawat Suwinai Phreusabenja of Inmindhamlet community on Soi Ari 3. 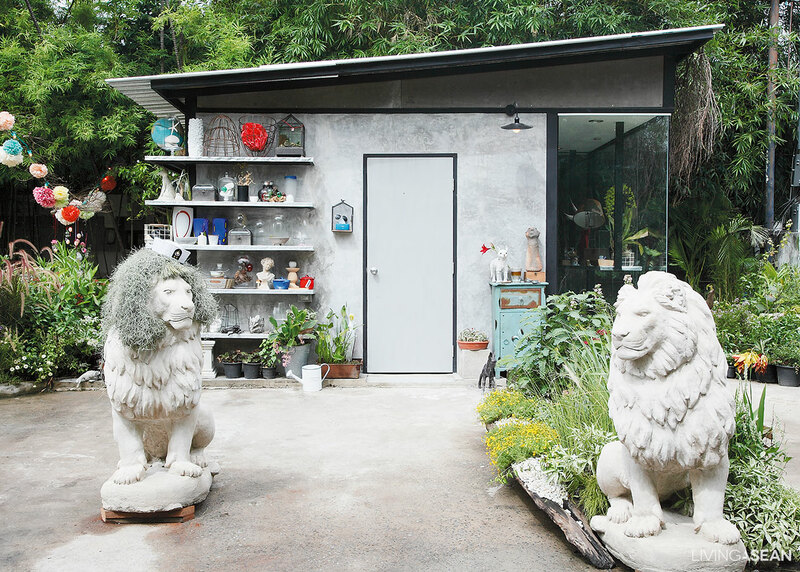 Located inside is the gardening shop Mc&Ami, where people love to look into the glass-partitioned display area at where butterflies are attracted to the scents of flowers. The Living ASEAN team itself became interested and came to investigate. 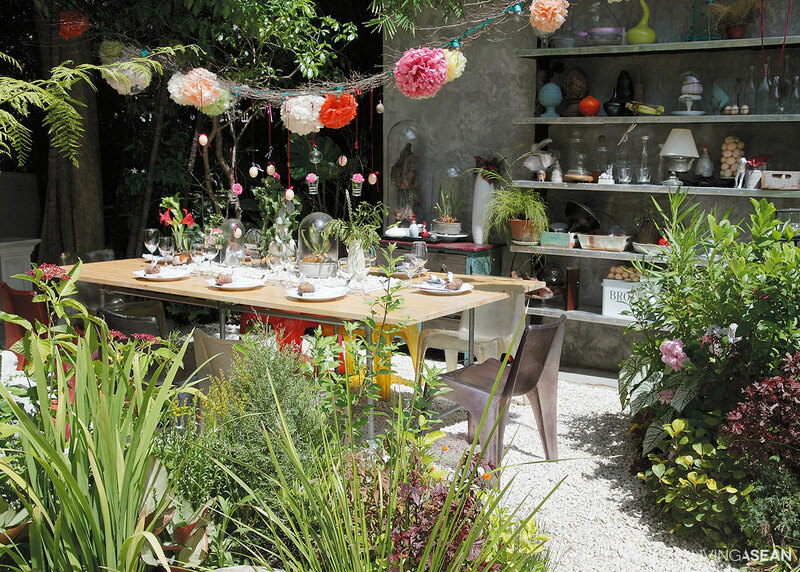 The table décor creates a bright, lively party atmosphere. 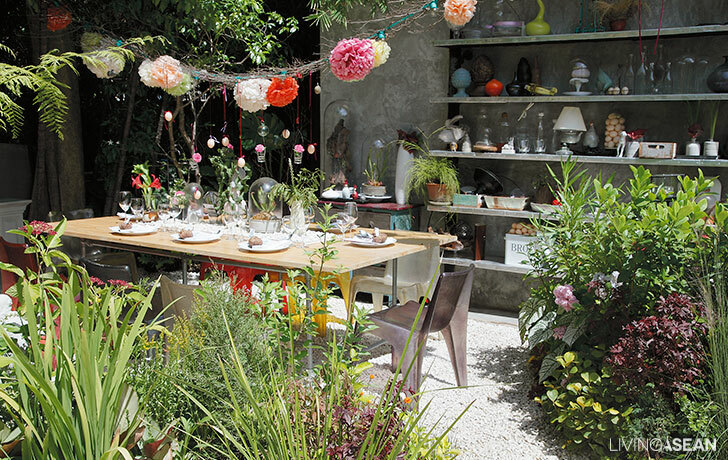 The dining table creates an intimate and uniquely festive atmosphere as surrounding garden ornaments and “showroom” shelves serve as a backdrop. 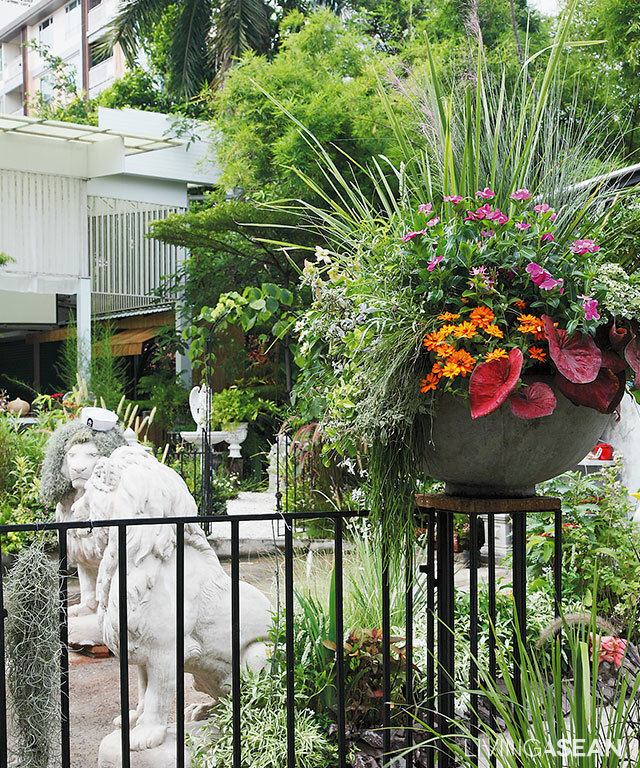 Combination flower planters beautify the entrance. 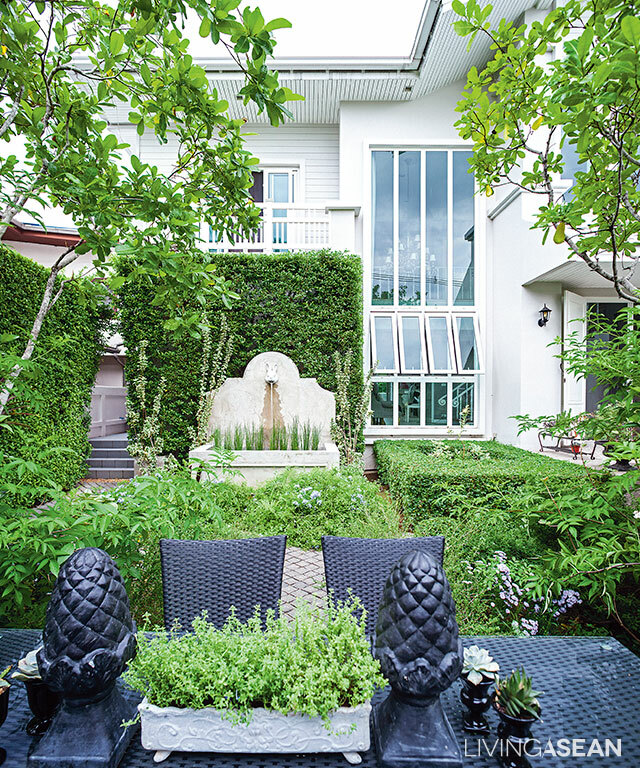 Thanawat got the inspiration from seeing flower vases set at different levels, tall leafy plants at the top descending down to small flowers. Thanawat Suwinai Phreusabenja, gardener and distributor of Mc & Ami gardening equipment, also the owner of Inmindhamlet Community Mall. After dinner, we walked around the garden, which is overflowing with decorative ideas. 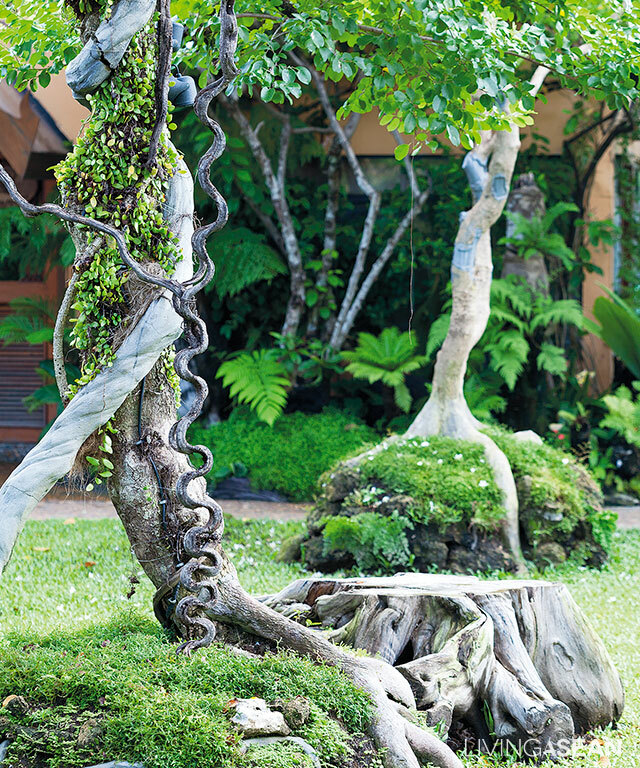 Thanawat himself designed the creative little cement doll family of pigs,lion statues using Spanish moss for a mane and ducks carrying egg sacks in their mouths. 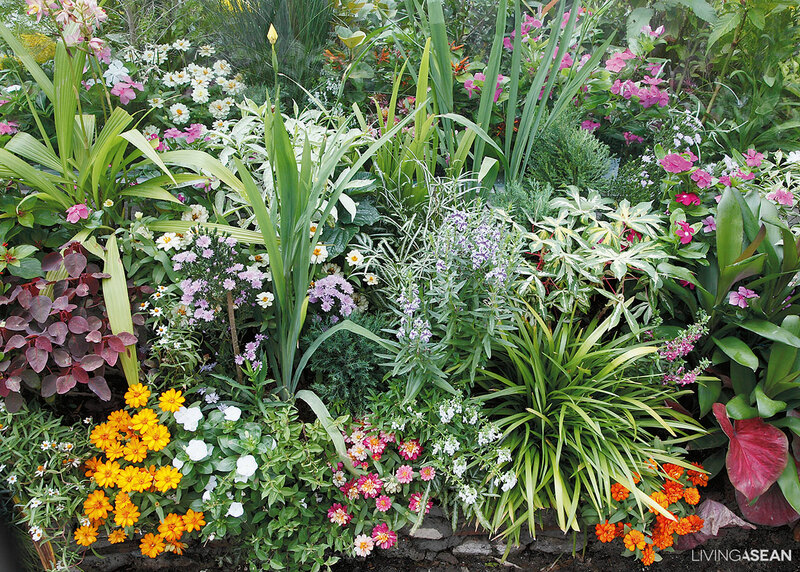 With unique choices and placement both flowers and decorative plants are mixed in with tropical rainforest varieties. Inclusions exotics and unusual kitchen vegetables which are all in vigorous growth. 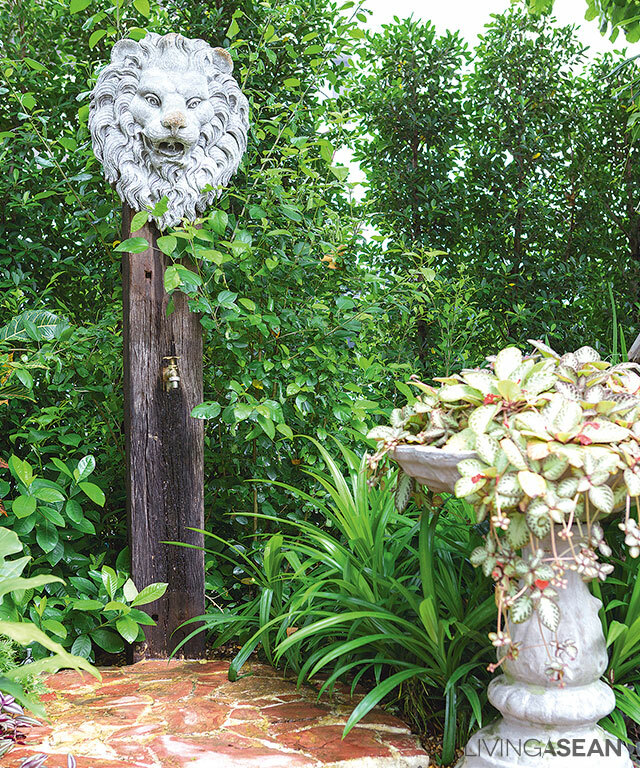 A pair of decorative lion sculptures: one displays an imaginative use of Spanish moss as the lion’s mane. 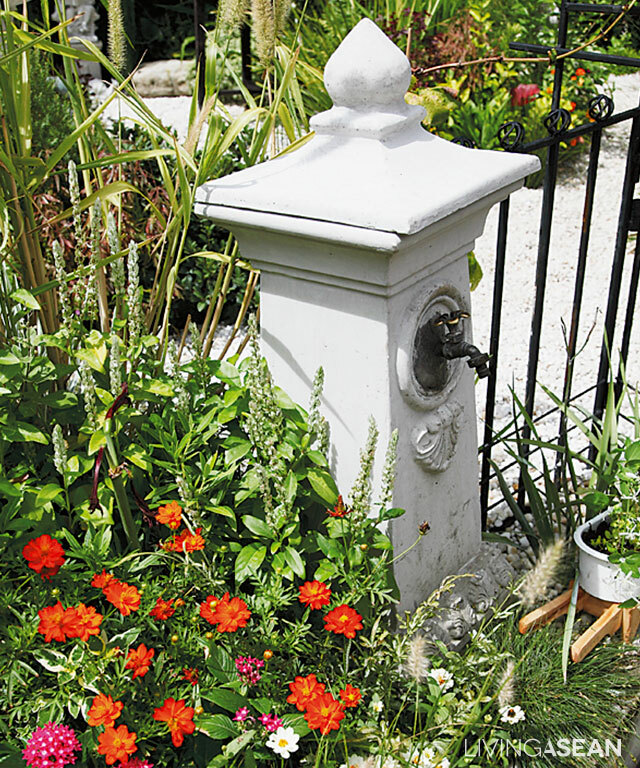 Entryway post with a faucet for watering flowers. Functional and attractive, too. Another minor miracle is that all this grows in what used to be a parking lot, which Thanawat covered in topsoil and gradually planted over. Small shrubs with flowering plants below. 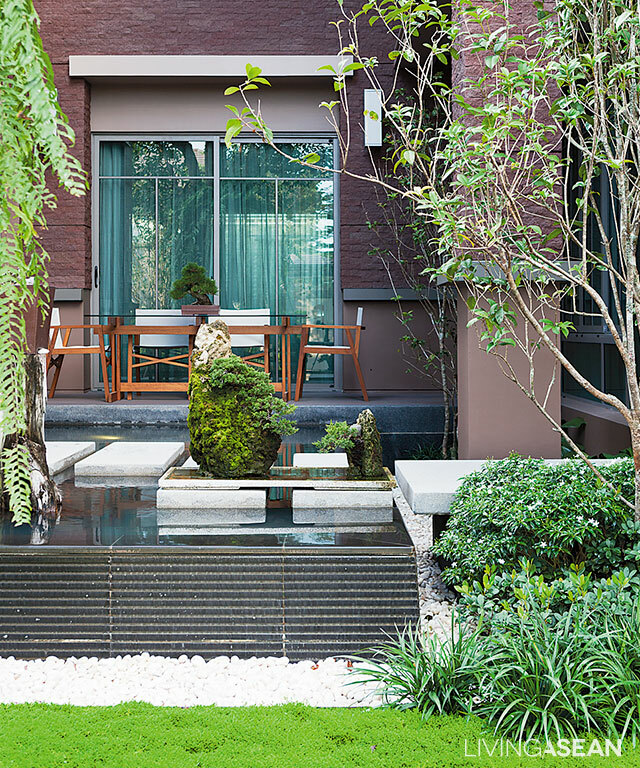 Rising above is a mix of leafy plants, broad and point-formed, creating a filled-out appearance. 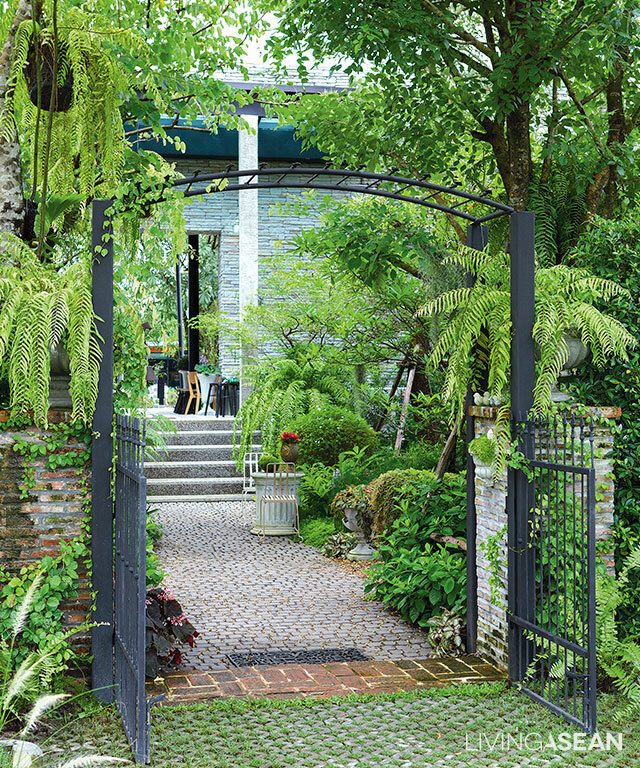 A gate through the iron fence into the garden, where a white gravel path contrasts nicely with greenery and ornamentation. We also have odd blossoming schedules and odd shapes that grow and nourish beauty. Adapt and don’t accept failure because the hard cement doesn’t fight back, but this is still a formula for success. 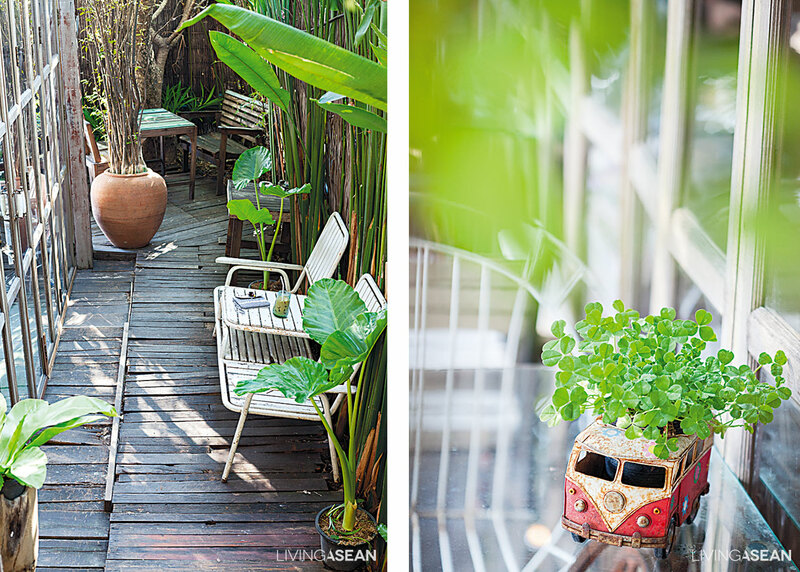 Besides flowers, there are kitchen spices like basil and pandanus palm that add color and beauty. 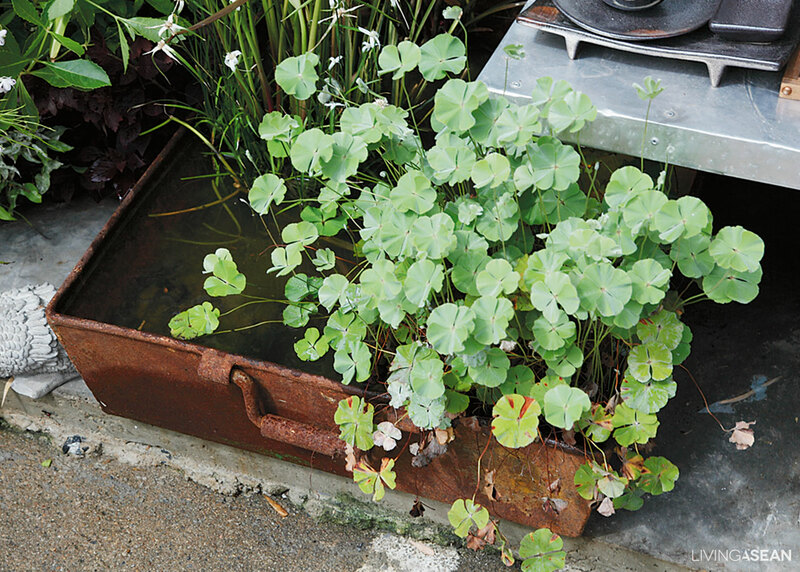 Small steel planter boxes trap rainwater. 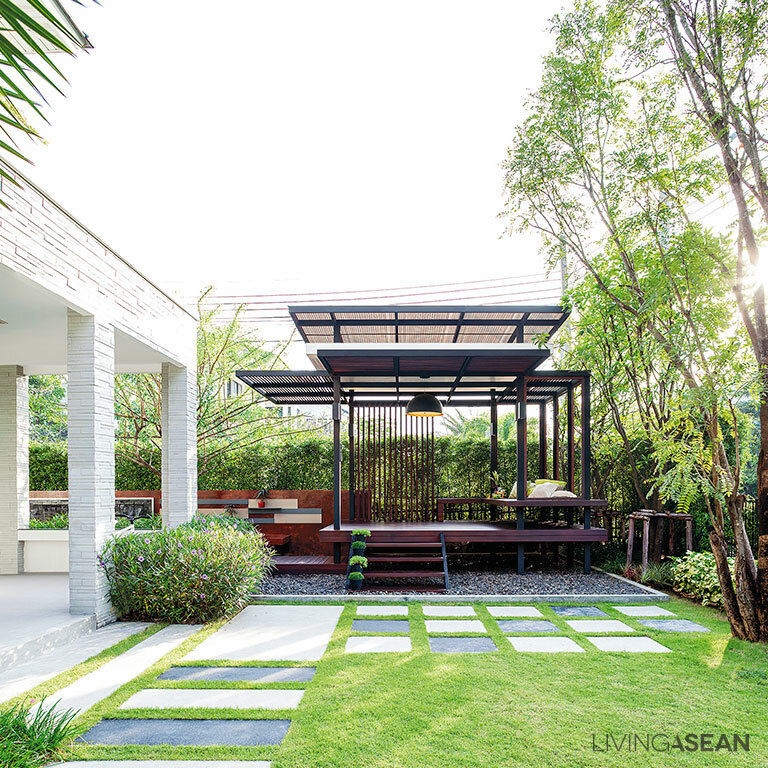 Semanggi and star grass add a chic look. Little joy with a cool lush green small garden in front of a pretty white house protected in front by a hedge of English banyan. 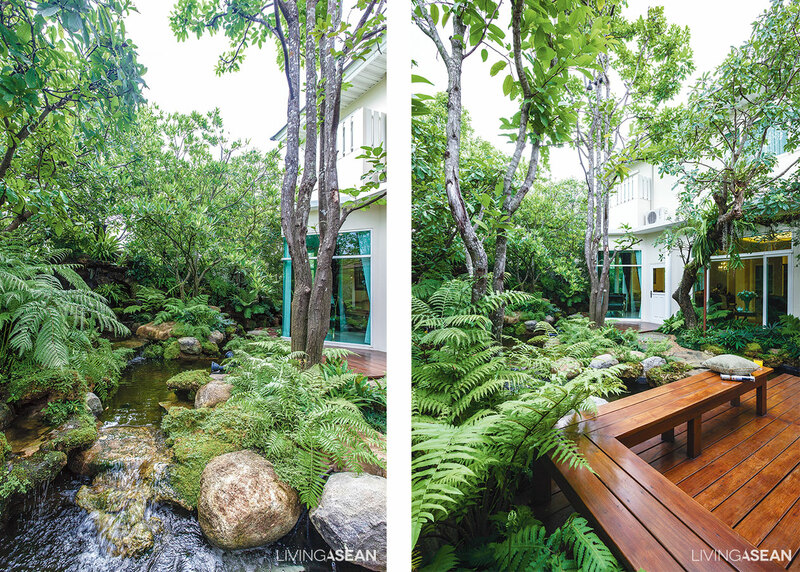 Sukanda and Chaiyanon Mimarayat were inspired to create this beautiful place by the book cover of Small Garden from Baanlaesuan Publishing. 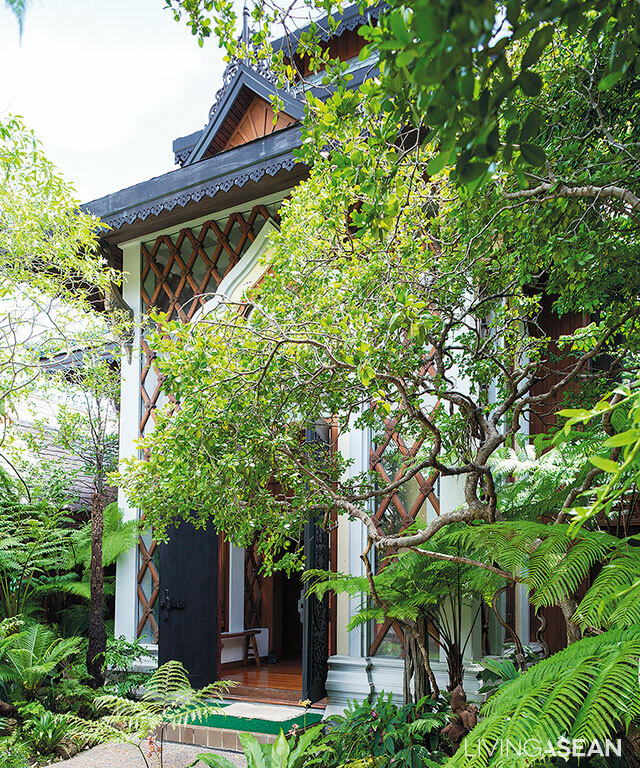 In the meantime Sukanda redecorated, the space adding on a small cottage in a mixed French country and vintage style and a relaxation room with a porch, walkway, and lawn, all while waiting for the garden to arrive. 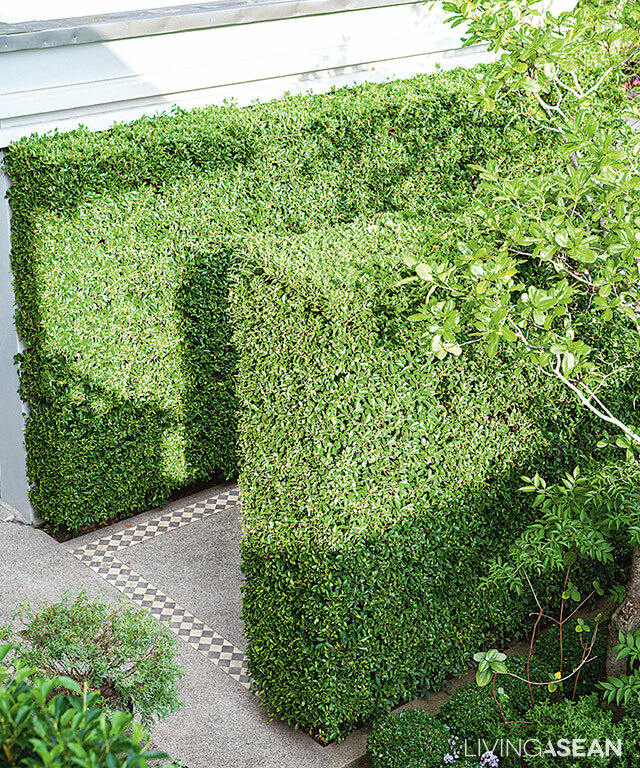 Inside the little gate is a comfortable space to sit, but the tall hedge keeps it private. 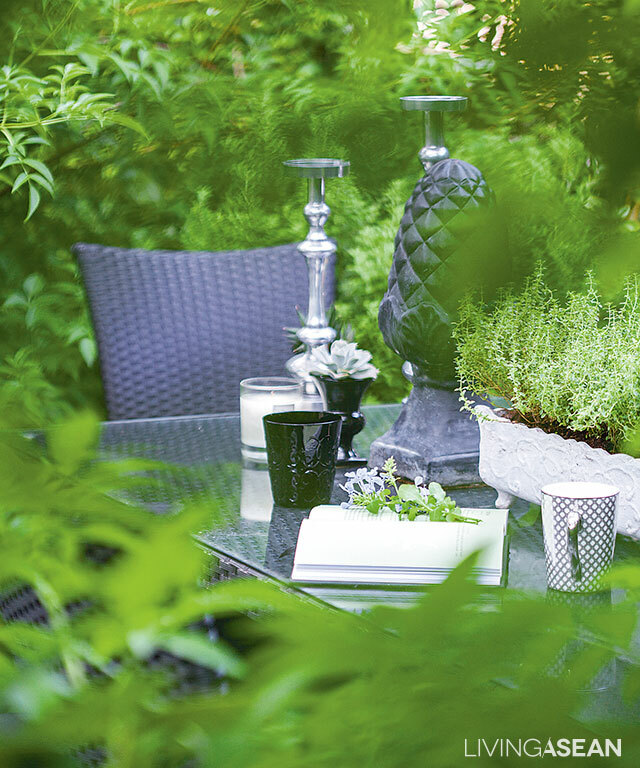 Inside the garden is a very private enclosed space, with a chic black lawn table on top of cobblestones set in diagonal lines, fragrant yellow gardenias, and bright flowers scattered here and there for a relaxing, casual mood. 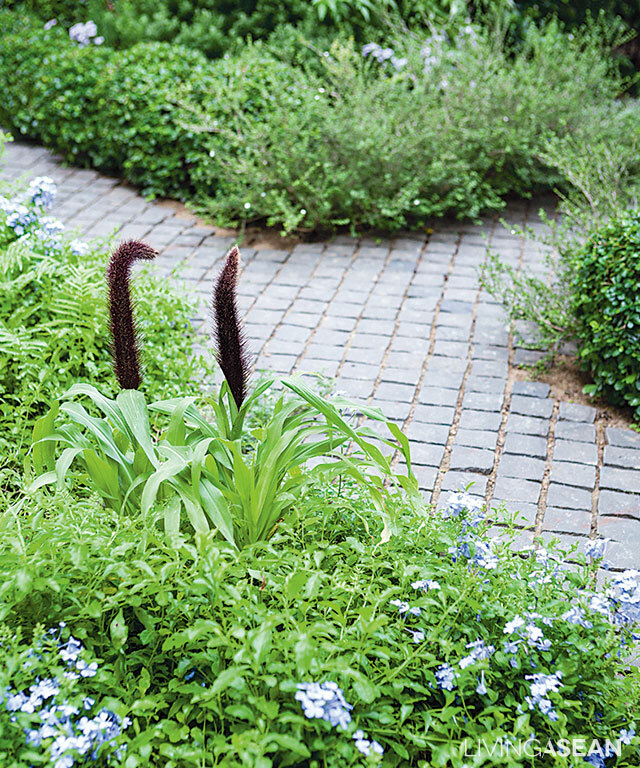 Near the pond, detail-textured cape plumbago encroaches on the walkway, with knot root foxtail adding a striking look. Siriwit helps with color coordination as well as prices and brands. 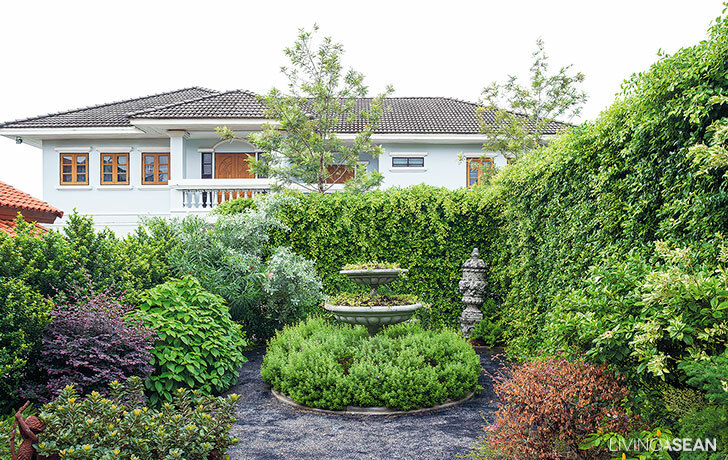 In the mix of plants he inserted Fukien tea and English banyan hedges trimmed into geometric shapes to relieve harshness so the garden looks orderly, but not too formal. 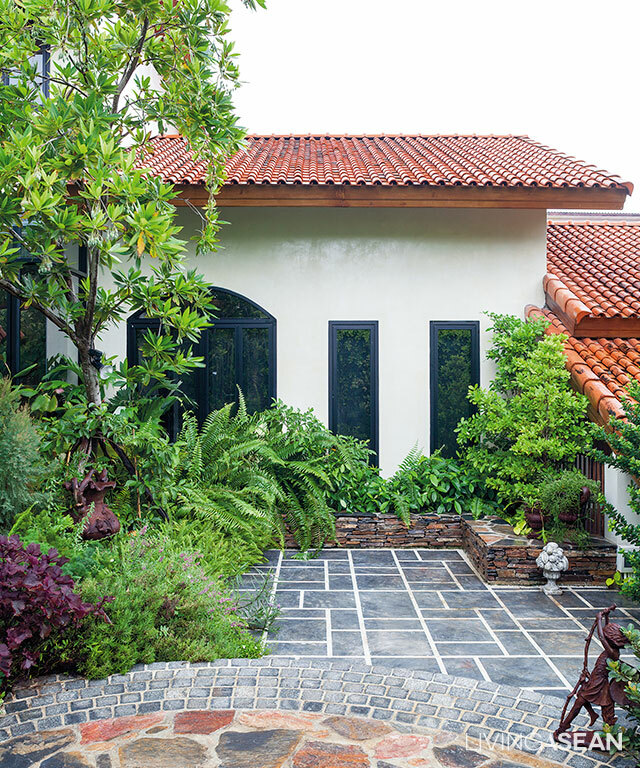 He adds, “I played with shapes and forms, the diamond-shaped walkway and yard with checkerboard lines of tile in the front. The central court is trapezoidal, so I took away the unevenness with two lines of banyan plants. 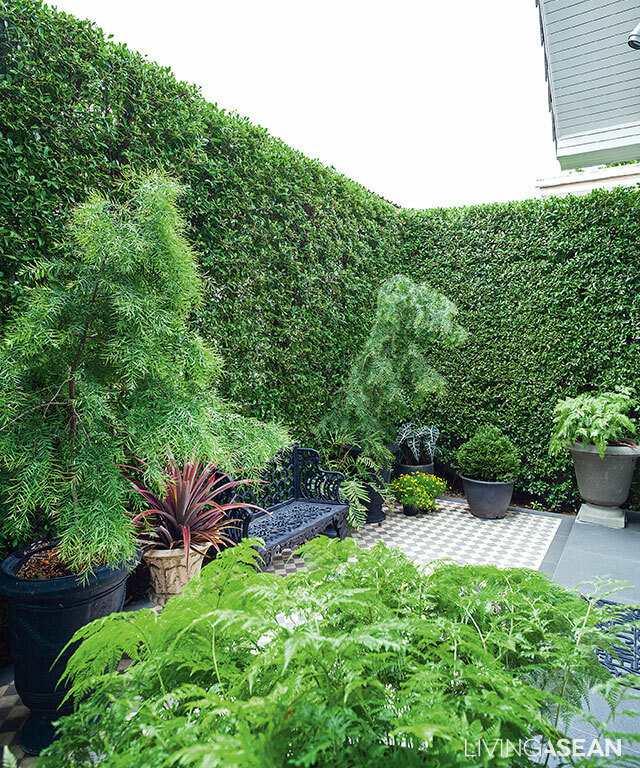 Hedge plants mixed in with free-form: semi-formal, easy maintenance; trim hedges every 2-3 weeks, or once a month if strapped for time. 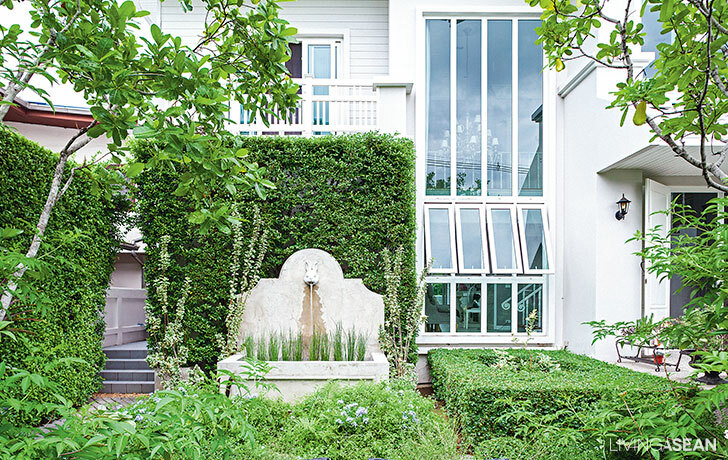 A beautiful verdant garden with a vintage feel. 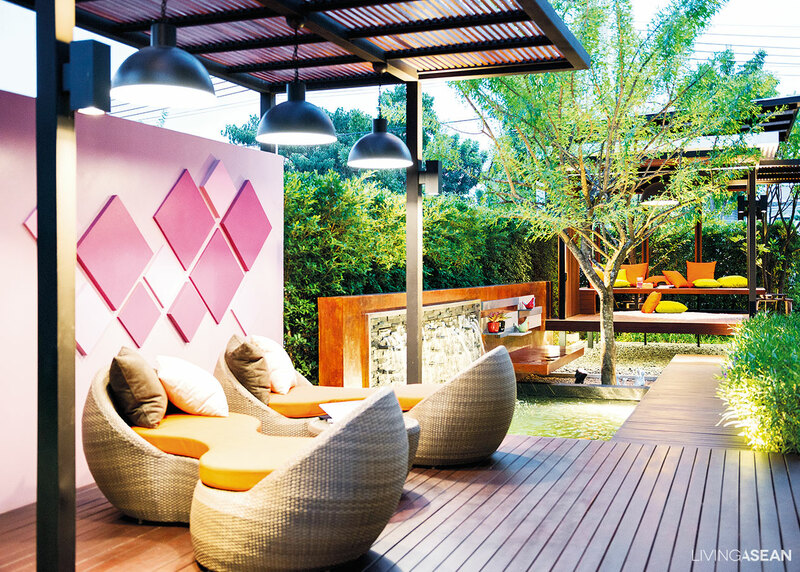 A place to walk in and relax with a cup of your favorite coffee. Peaceful, relaxing.Once you’re here, where else would you want to go? 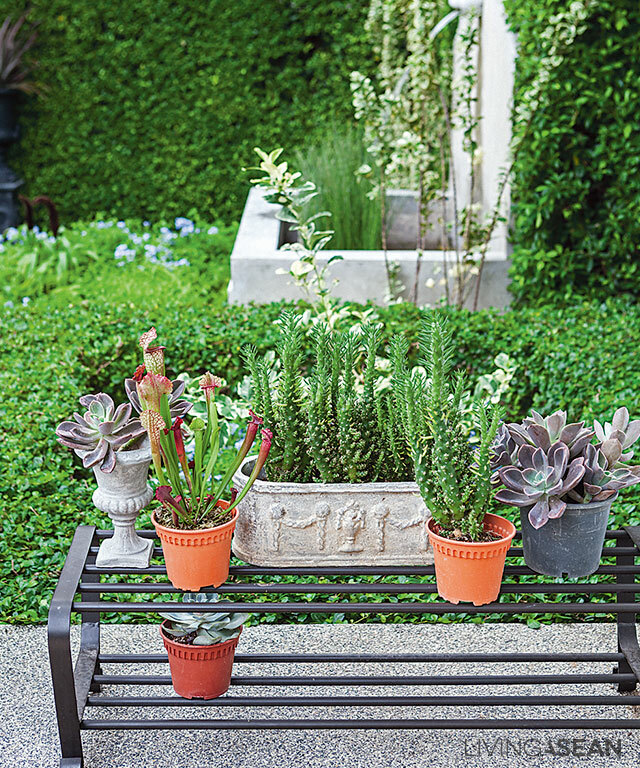 By the owners’ design, attractive flowerpots adorn a shoe-placement shelf. 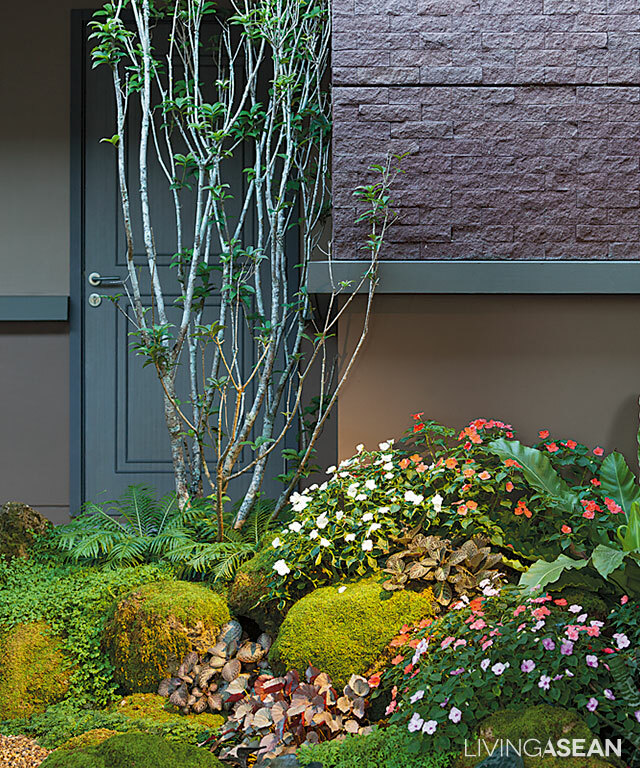 Between the house and relaxation room the indirect light calls for shade-tolerant plants like the dwarf neon hydrangea along the path. 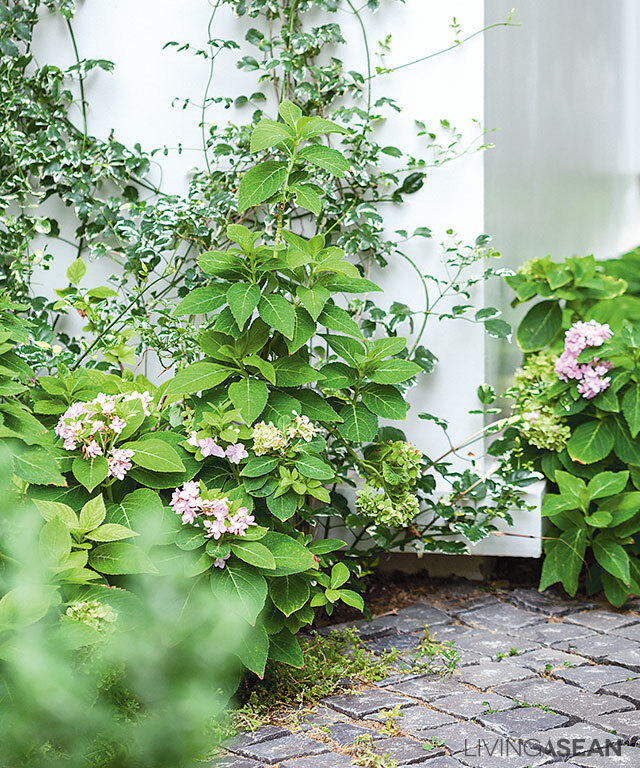 Pink-flowered hydrangea contrasts with vines of spotted jasmine climbing the house. 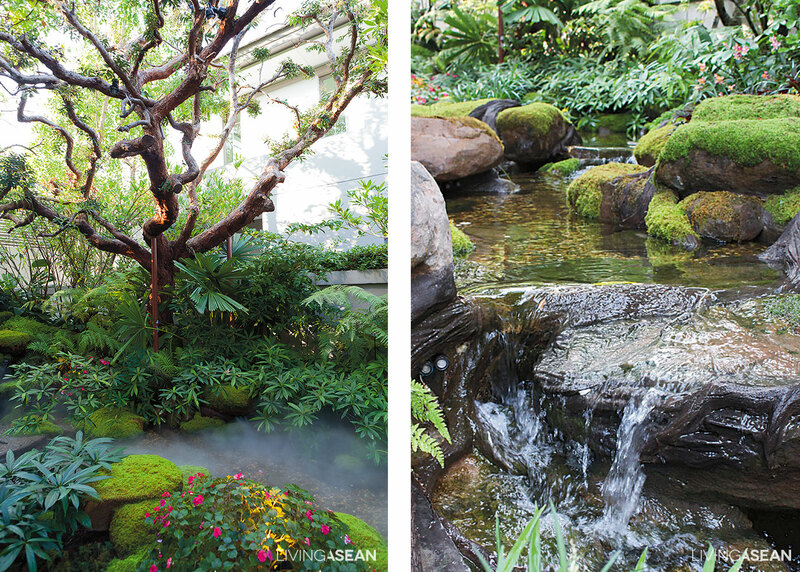 Relaxing shades of green dotted with colorful flowers amid the misty coolness of the tropical rainforest in a Zen-inspired garden. 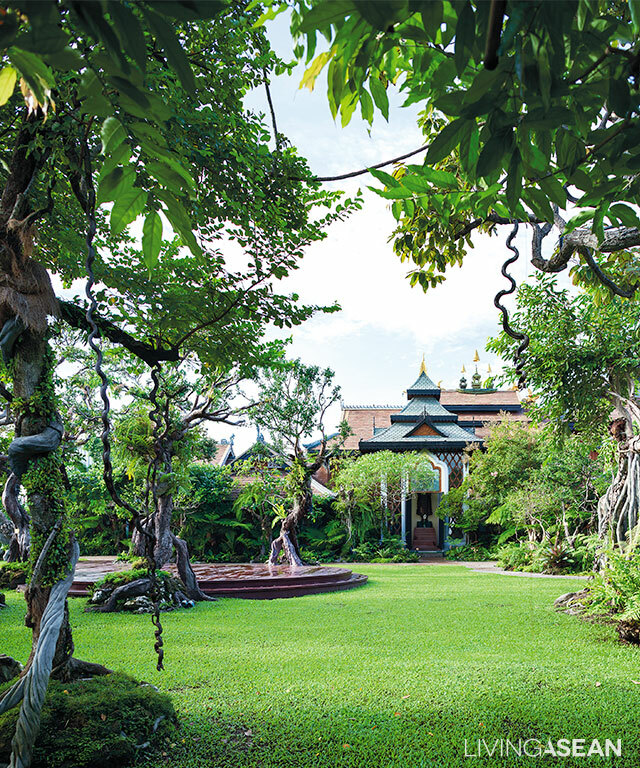 Such is the dreamy garden of Chokchai Ratanaparadorn. 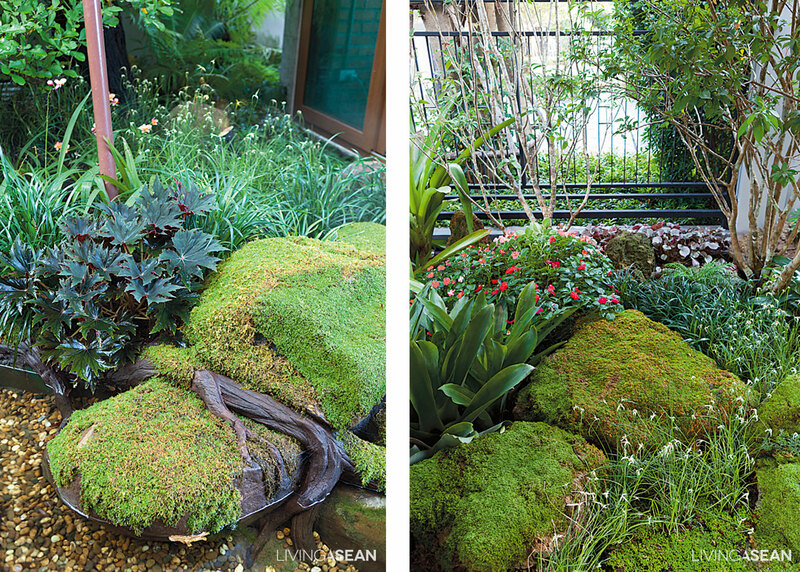 Artificial tree roots and boulders mix with plants to give a realistic impression of a jungle environment. 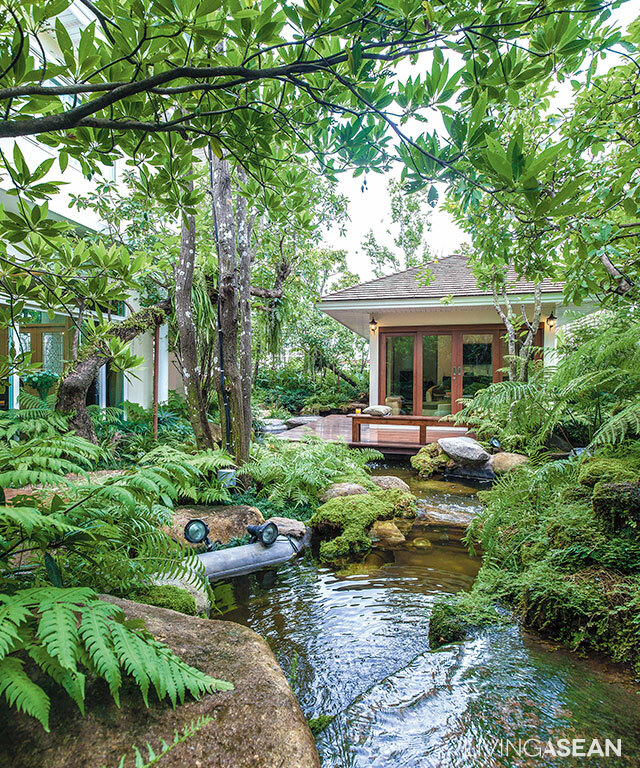 Warawut described his design concept for the front area as “a peaceful, open modern Zen garden, coordinating shade and cool water to create a tropical jungle, and continued, “we dropped support pilings to create a framework above. We avoided having a lot of weight to support by using artificial rocks and tree roots. The filtration system was efficiently hidden under the wood deck. The concepts came from my experience with natural ecology. 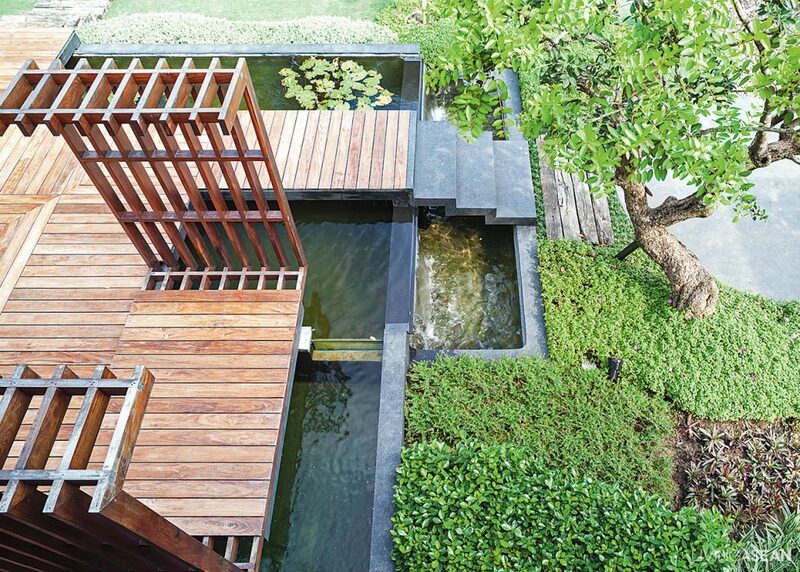 Designer hid the pond filtration system under the deck: a space-saver. Placing the pond in the shade on the north side of the house keeps the water cool enough for the plants and fish. 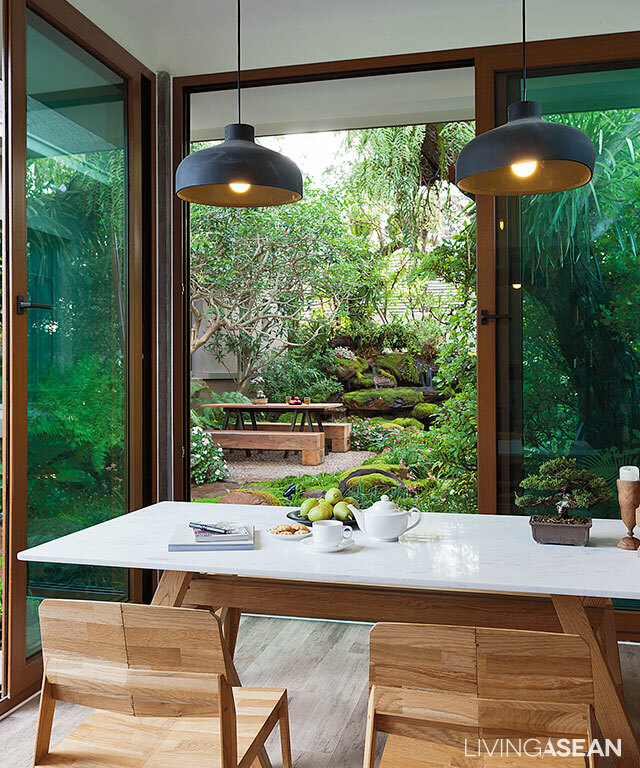 Bare cement and simple indoor furnishings add to the modern Zen feeling of the surrounding watery garden. 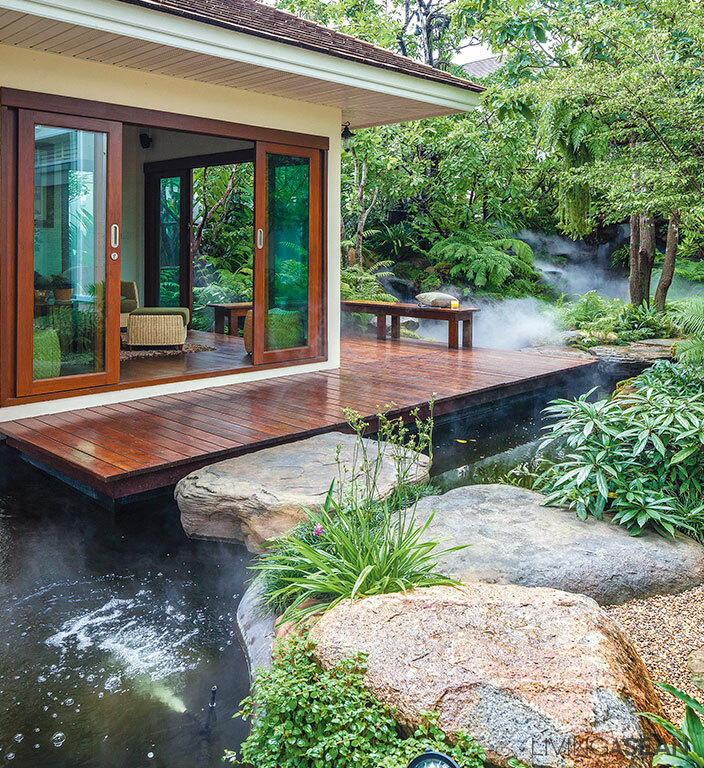 Work inside the house with a pleasing waterfall view. 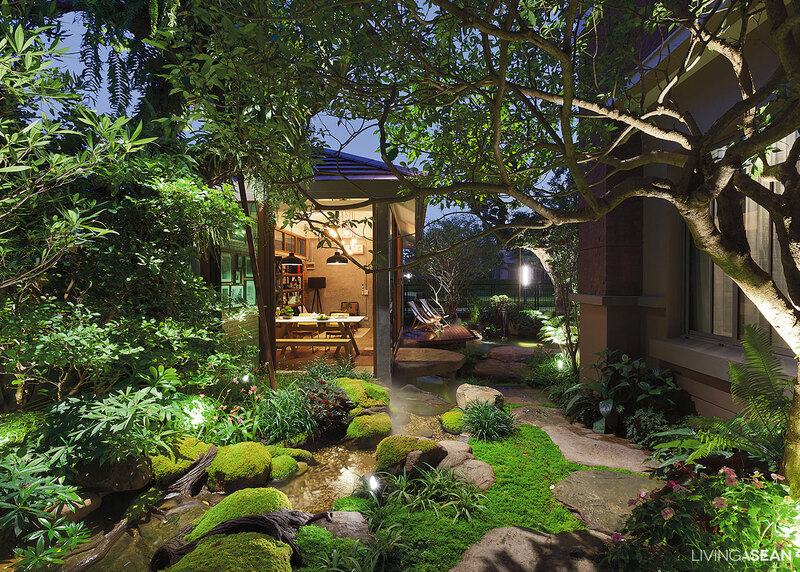 Lamps shining both from above and below at night create dimension and a sense of motion as they highlight plants and tree limbs. 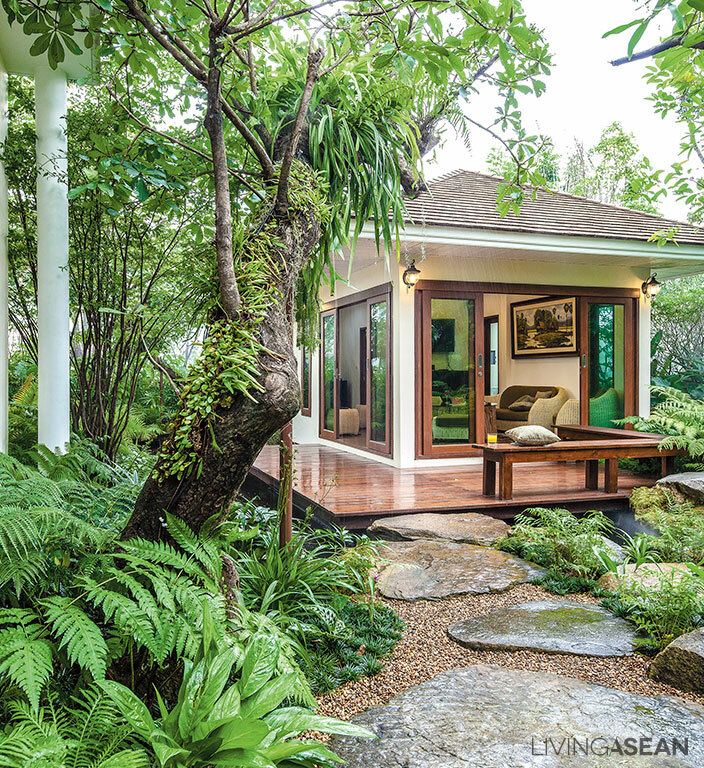 What is the real function of a garden in the house? 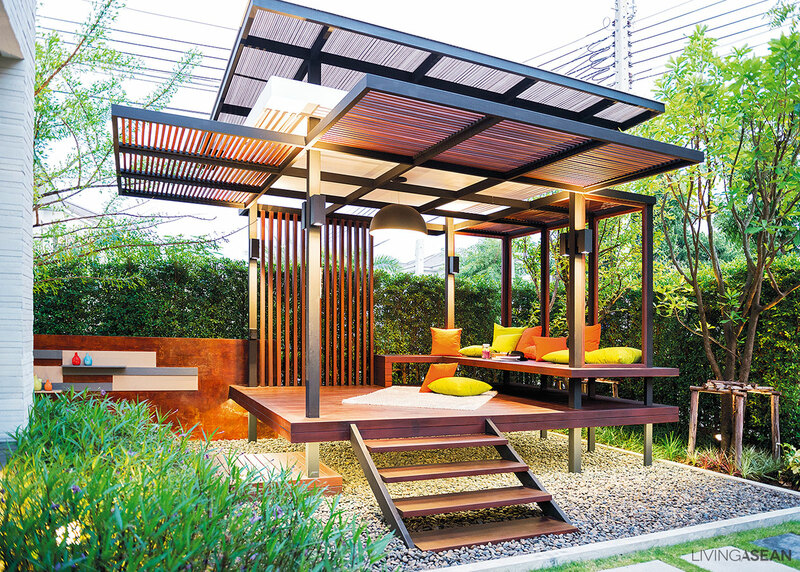 The owners need the garden for their family and talked to a landscape designer to build a pavilion and a small waterfall wall for outdoor living and garden for family activities. 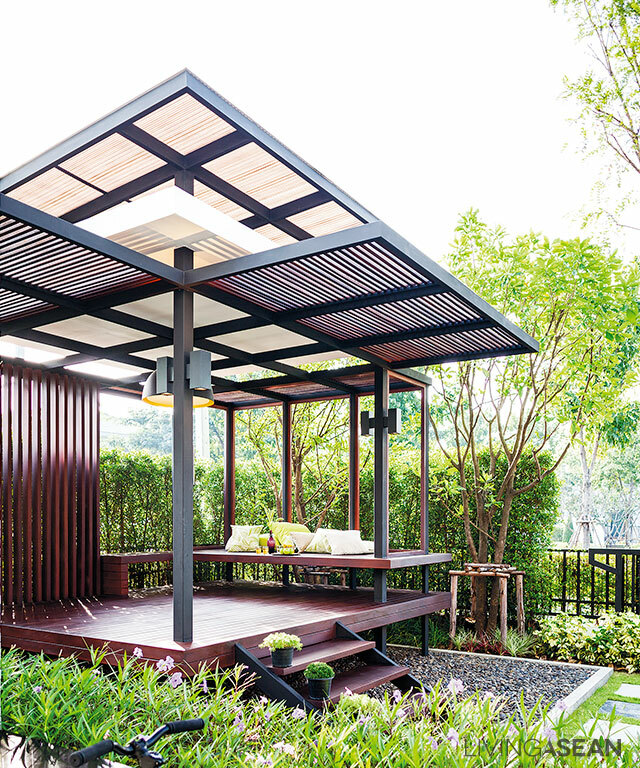 The designer placed large free-form plants such as patana oak, millettia brandisiana, and calabashin the rear to relieve the rigidity of the pavilion structure. The wide grass lawn can be adapted to different activities. 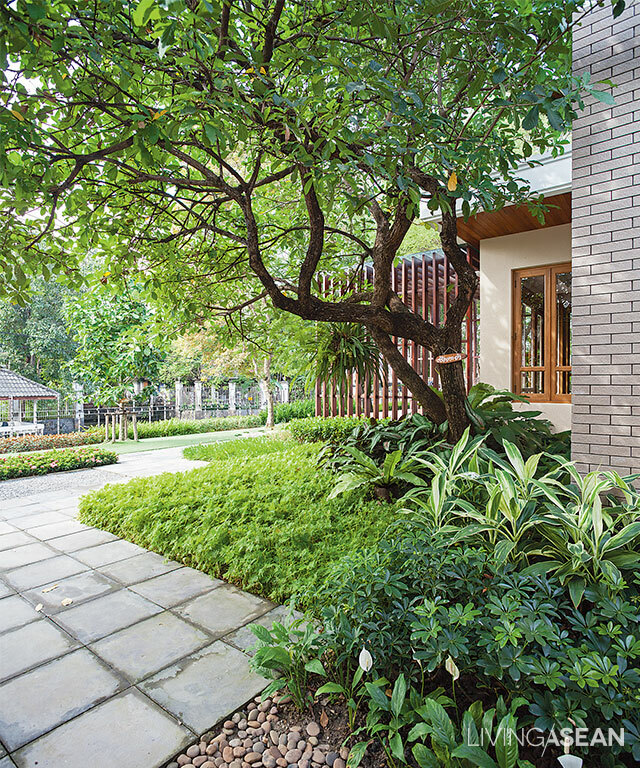 A stylishly modern sand wash concrete walkway leads in from the front. 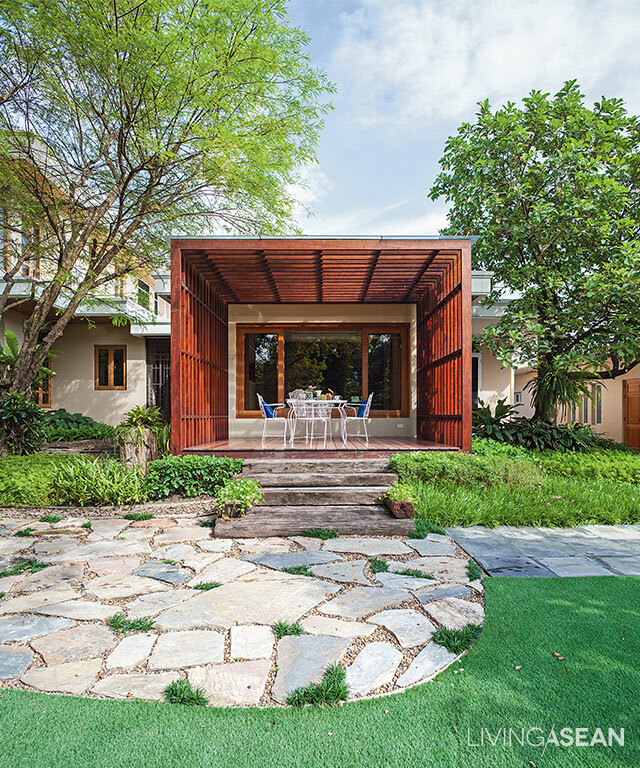 When buying a house one needs to consider the surrounding environment, size and placement of the building, style, and usable outdoor space. 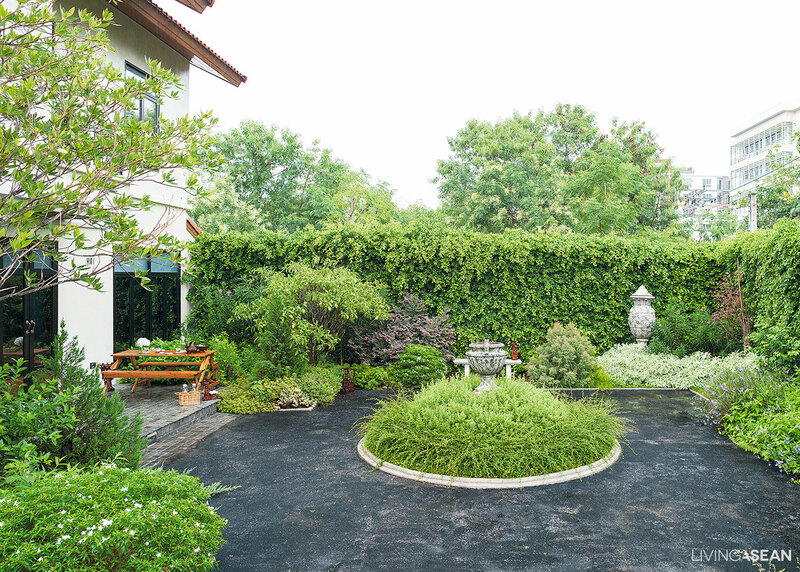 The form and layout of the pre-existing garden are less important. 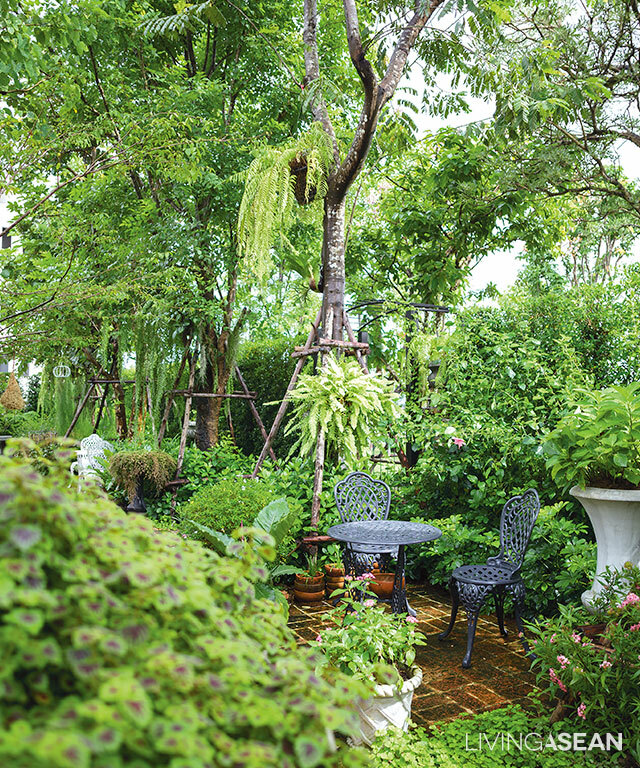 This is how it was for Chana and Nopphawan Najaroenkun, who own this beautiful family activities’ garden in Bang Phli District of Samut Prakan. Chana beams as he talks about it. 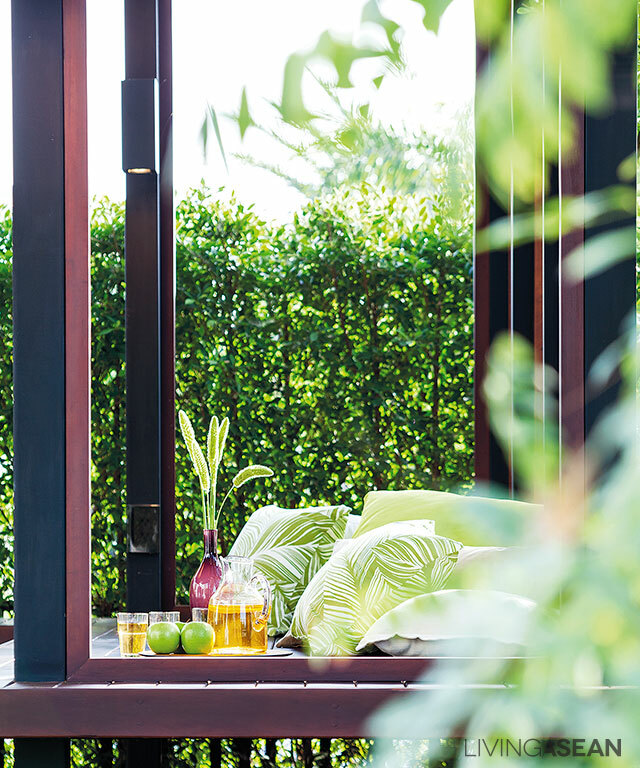 Lounge in the gazebo on cushions or mats and bring out fruit and pastries, a perfect formula for pleasant relaxation. 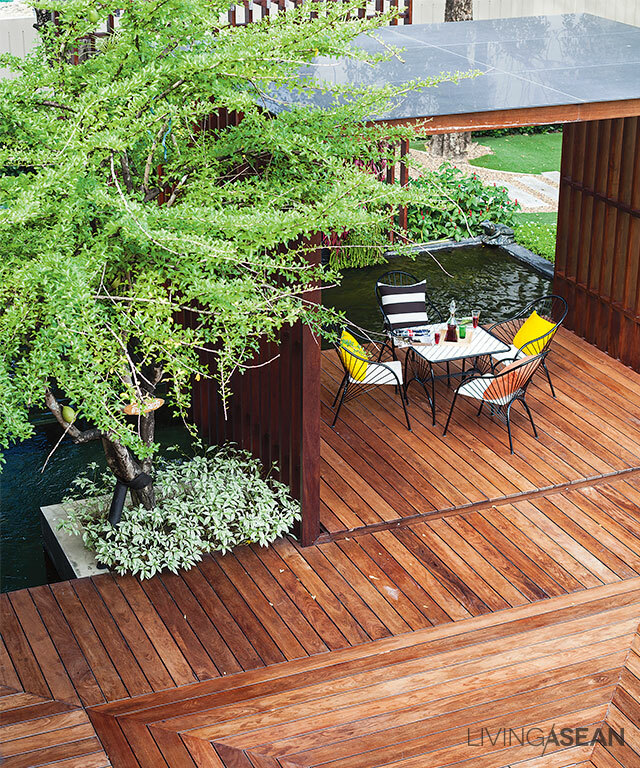 The Pavilion, wood deck, pathway, and other hardscape elements designed in a complementary pattern of rectangles. 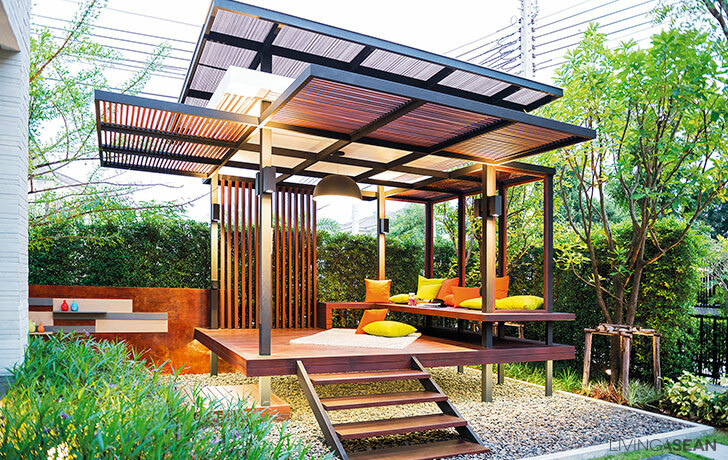 The pavilion is raised 60 centimeters to dissipate heat and let the breeze pass through. 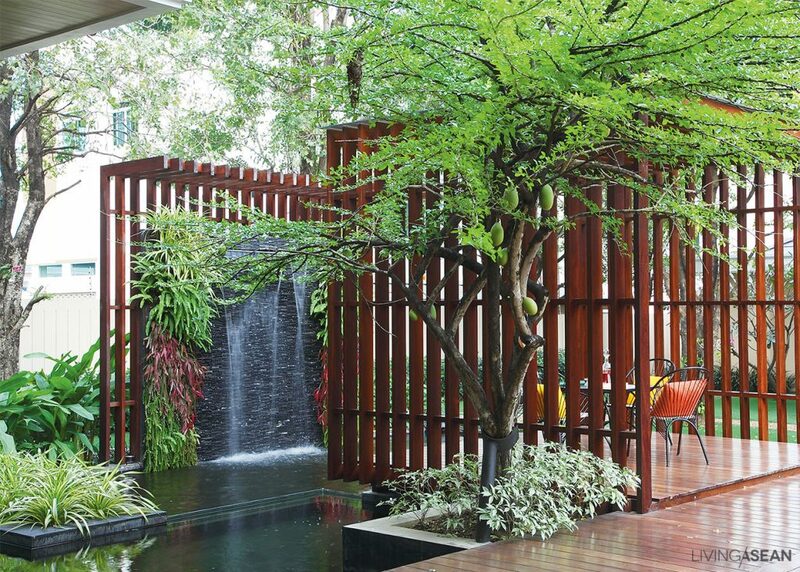 On the right-hand side is a tall green fence of English banyan which is an interesting contrast to the rust-colored fence by the pavilion. 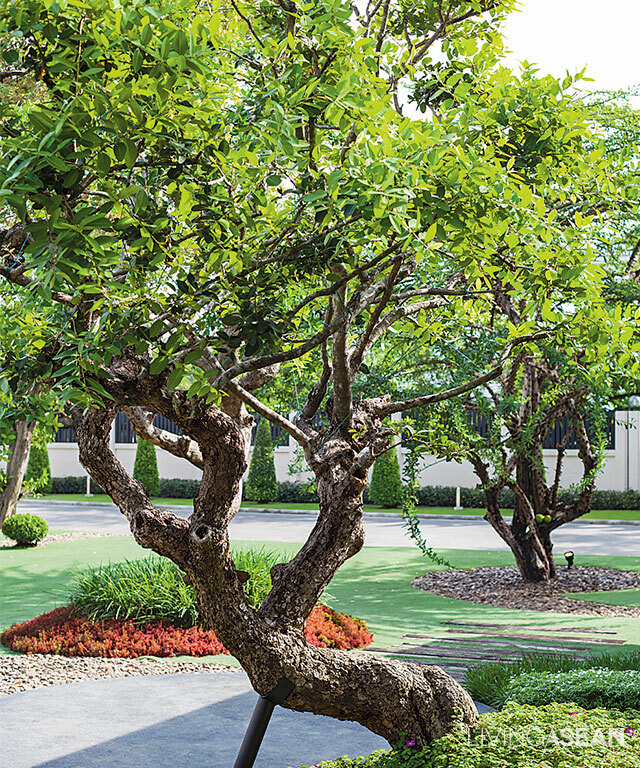 The beautiful, open-limbed form of a calabash tree set right in the center suits the overall modern design. Another place to sit behind the house, next to the Thai kitchen. The owners like sitting here while dinner is being prepared. In the evening there is a different atmosphere, with special lighting for a gentle relaxing elegance. With the light shining up through the water onto the waterfall wall adding new dimensions to the overall look. 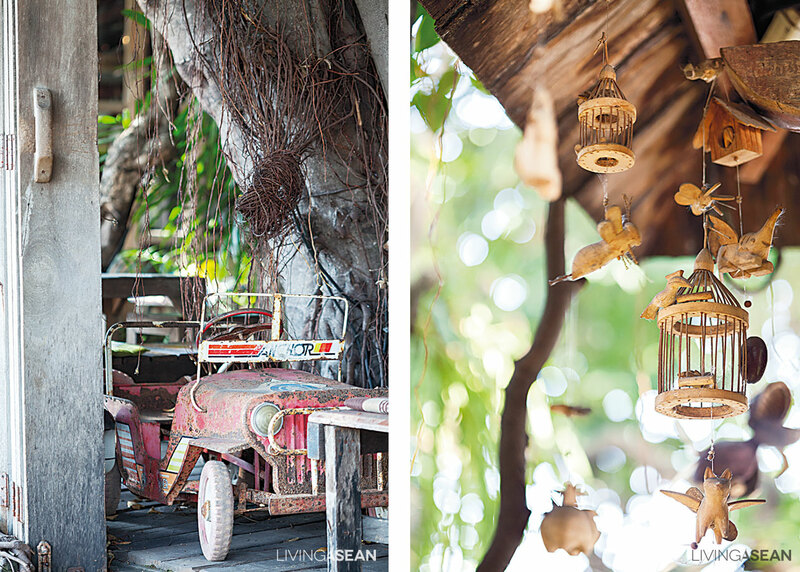 The sun is scorching hot this afternoon but inside Baan Nai Suan, a cozy tropical garden in the coffee shop. It’s cool and refreshing . 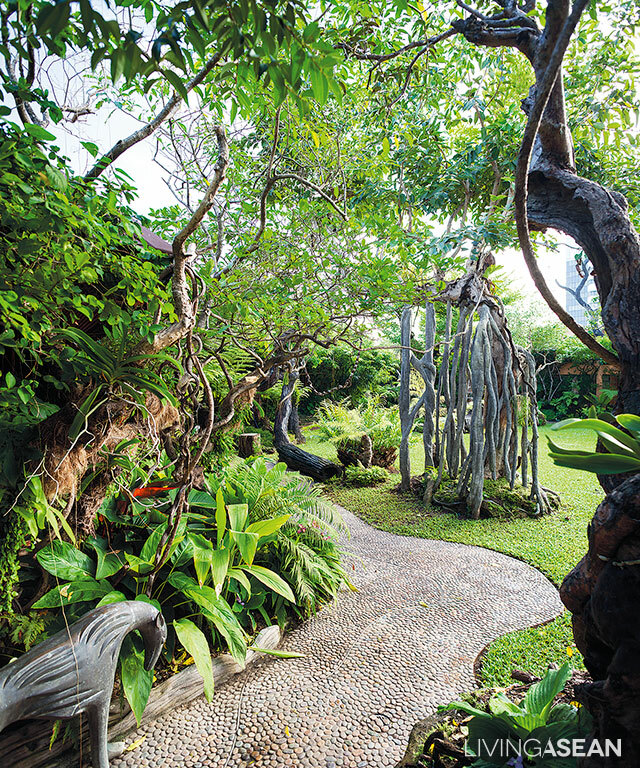 Warisa Sinlapakun, the owner who designed and landscaped this garden on her own has a lot to tell us. 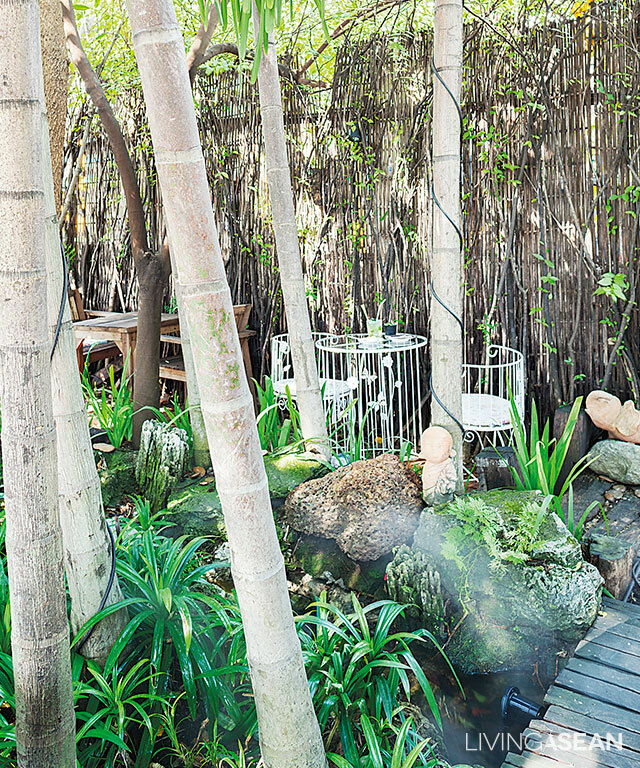 Garden in the coffee shop: The shop is a step up from the street. 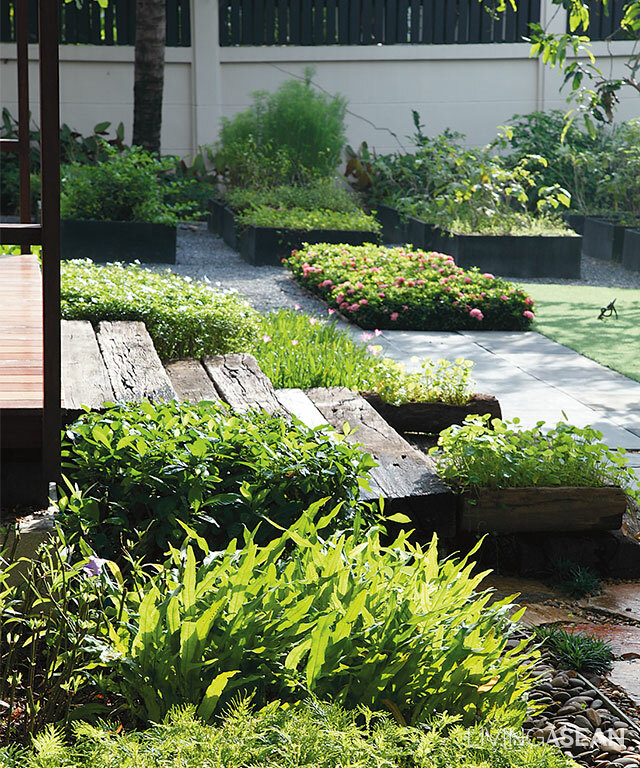 In front are planted creeping woodsorrel ground cover among decorative stones bought at Bang Bua Thong. An arboreal wooden door leads inside. 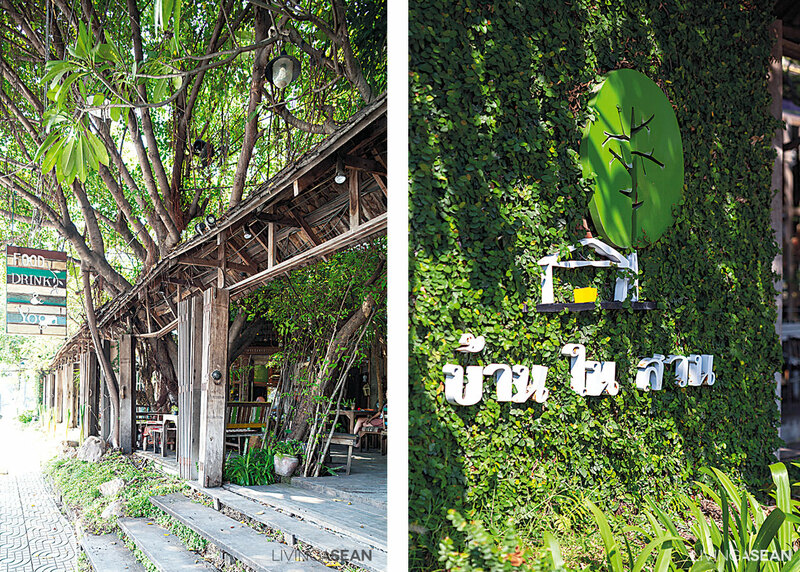 Baan Nai Suan, on Hua Mak Street, has two main sections. The first is the coffee shop, restaurant, a wood structure with food and drink service on the lower floor and a high-ceilinged yoga studio with big picture windows upstairs. 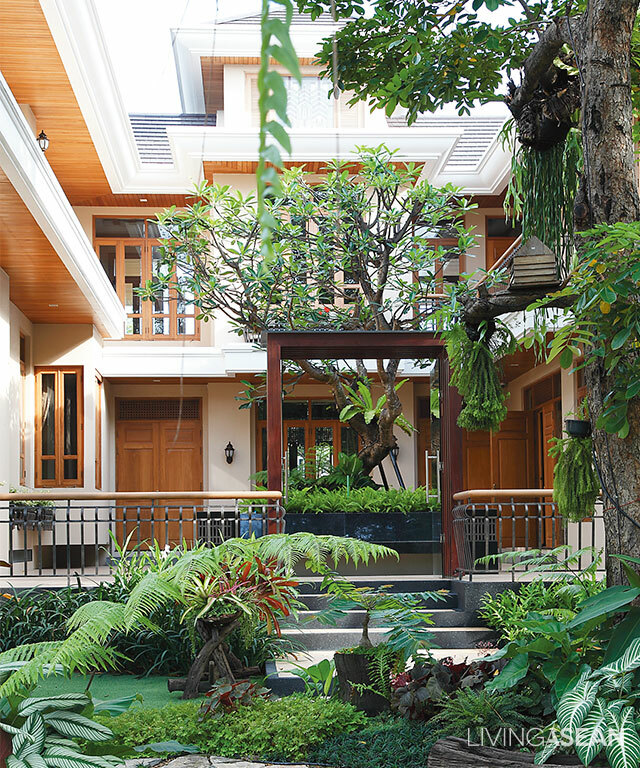 The second section is a beautiful tropical-style garden. 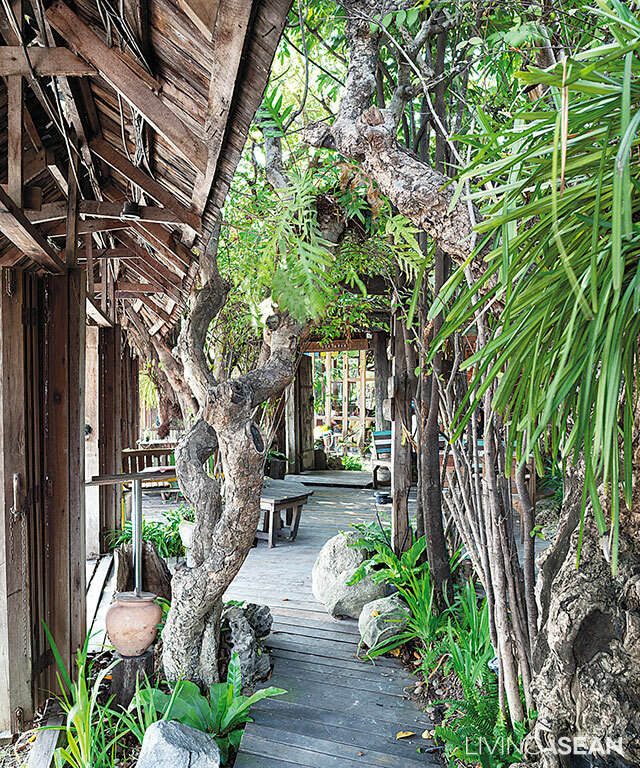 Long shady wooden walkway to the shop inside passes under the arbor eaves. 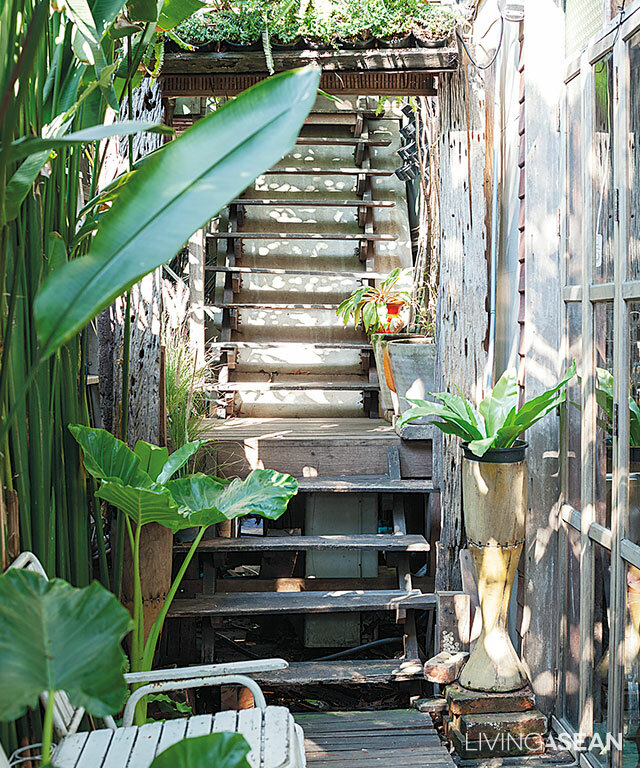 Stairway up to the second floor, with the added interest of potted plants here and there. “The garden started as just dirt, not a single plant. 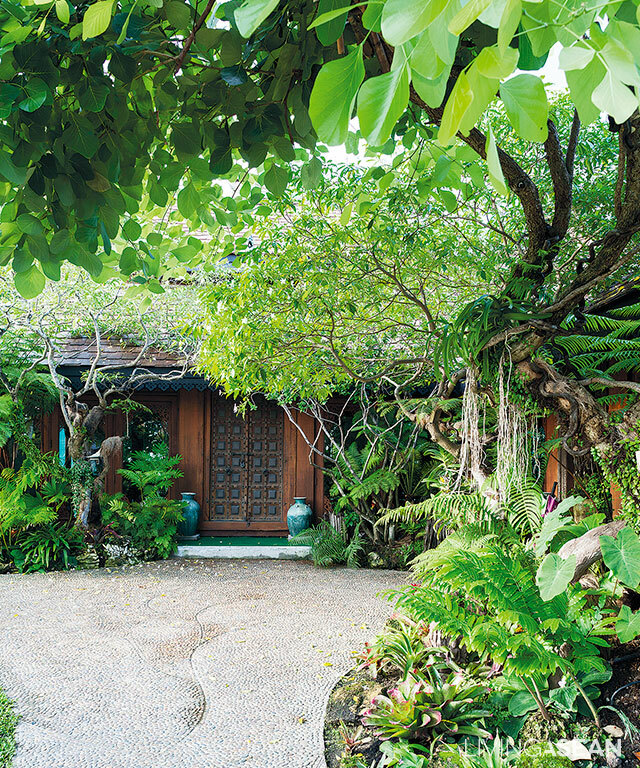 I don’t have a degree in garden design, but do have ideas, and love the tropical style. I used pencil and paper to draw details, spots to put trees, dig a pond, sketched in a waterfall, brook, and places to sit. 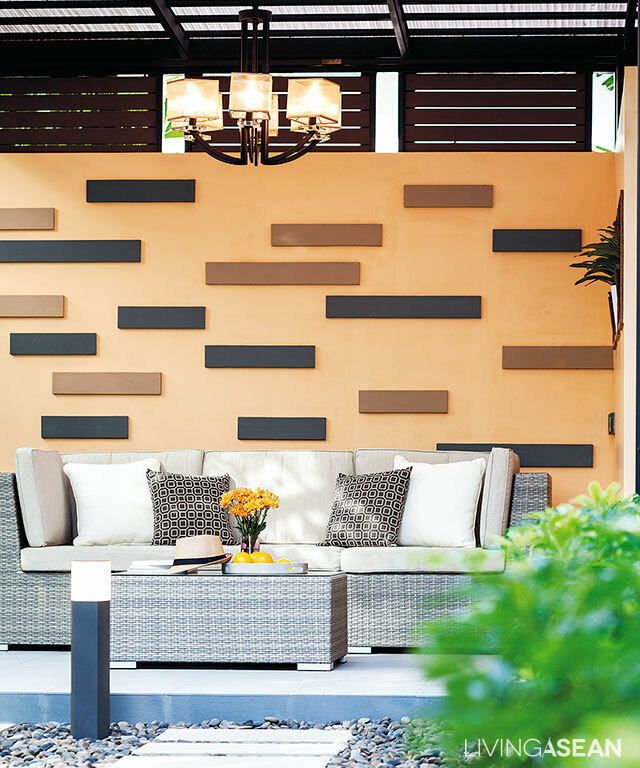 Areca palm and a bamboo wall, plants and materials that fit the tropical style. Fragrant pandan is not only a beautiful plant, but it is for its oil or cooked in various treats. Unusual furniture: wrought-iron table converted from a sewing machine, a set of unmatched lawn chairs, perfect for outdoor use. Every morning her helpers water plants, rake fallen leaves and add fertilizer, a maintenance system She has down pat. But improvements are ongoing. New plants must be shade-tolerant, since very little light reaches the garden floor here, which is why even in the middle of the day it’s cool and comfortable. 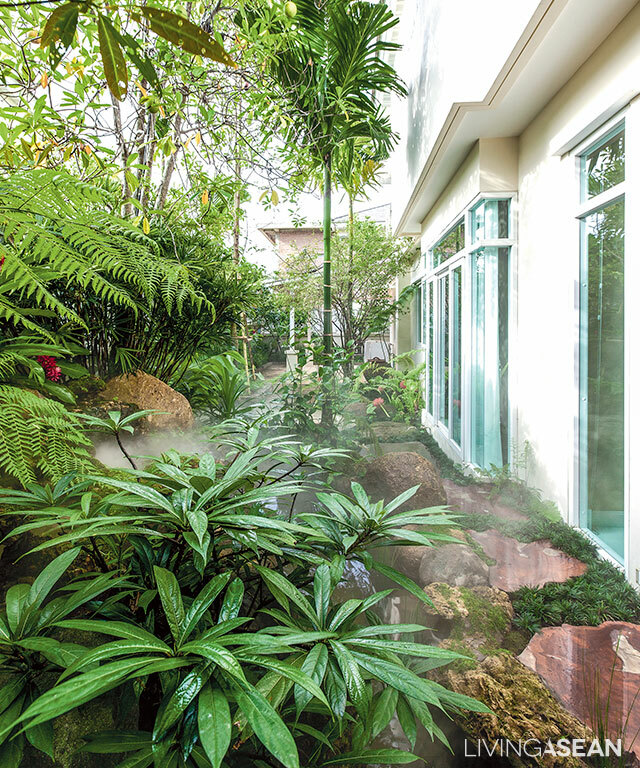 A misting system adds to the refreshing cool of the garden. Plaything: an ancient VW van model used as a cute planter box instead of a vase. 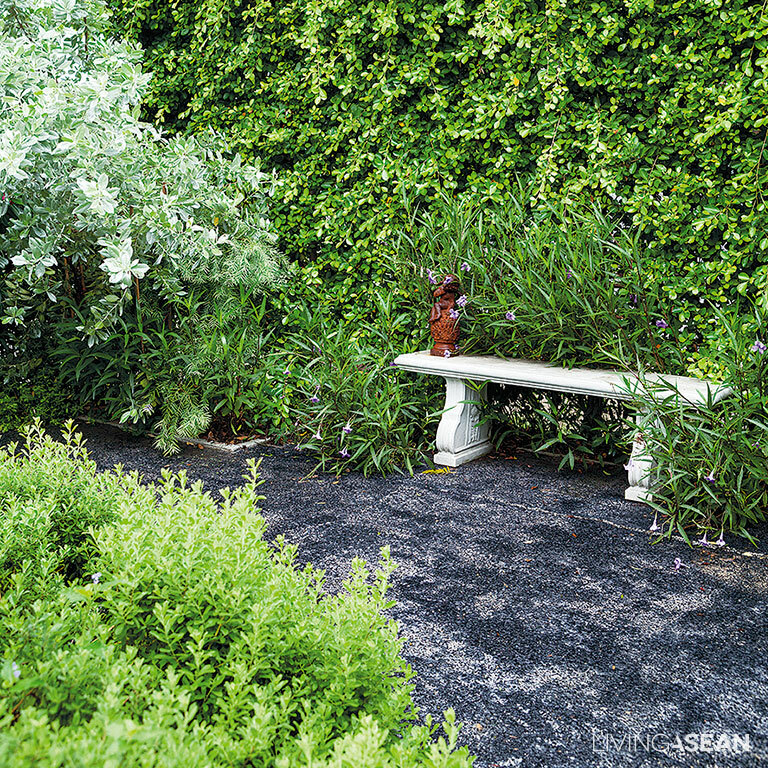 As we stand in front of this secret garden, the fragrance of jasmine trees reach out. 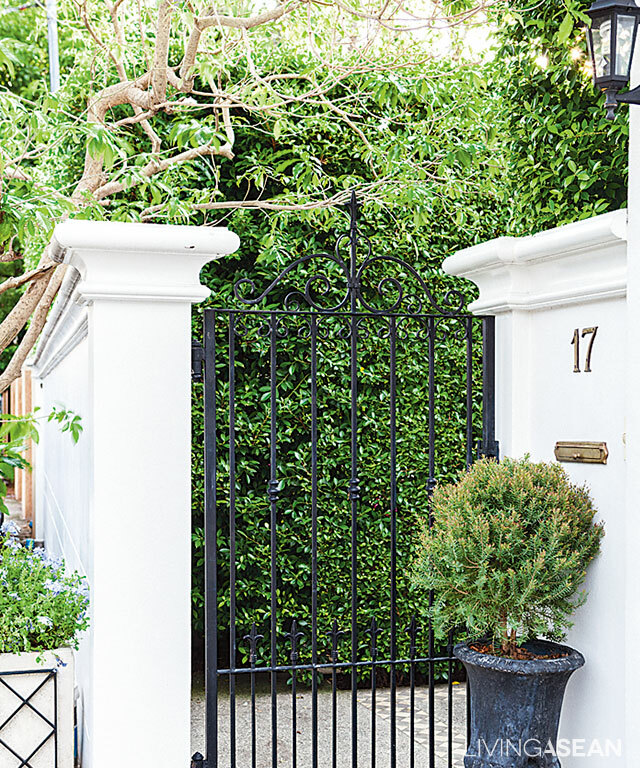 The gate opens, revealing dazzling white flower clusters, petals spread across the driveway. 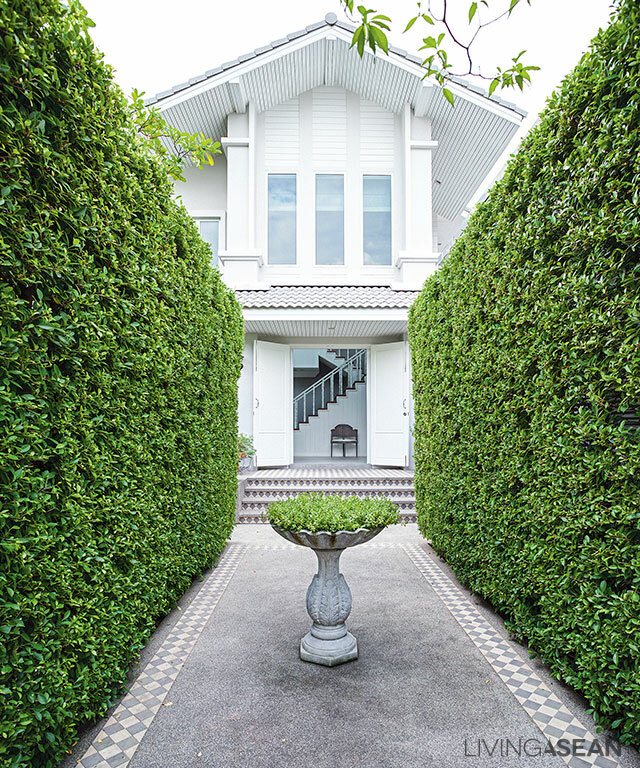 Surrounding the house is a tall banyan hedge. 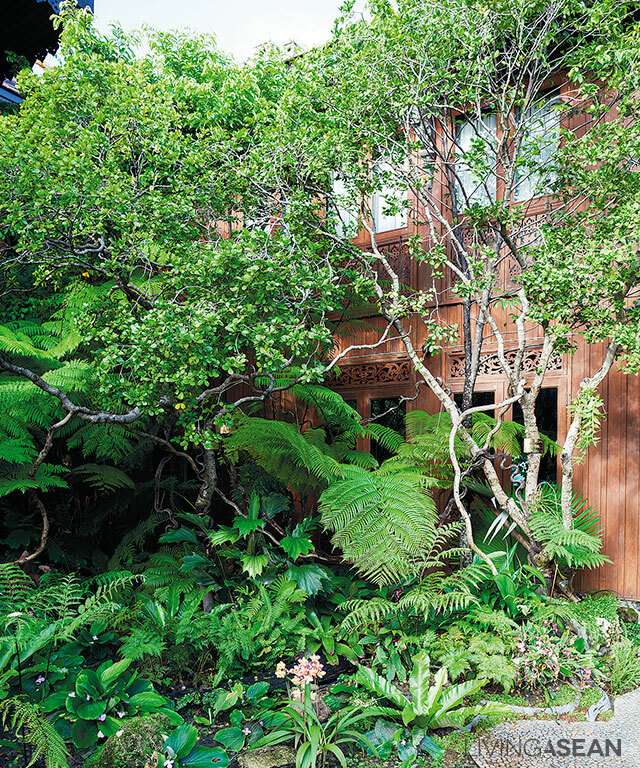 Is a secret garden hidden inside? 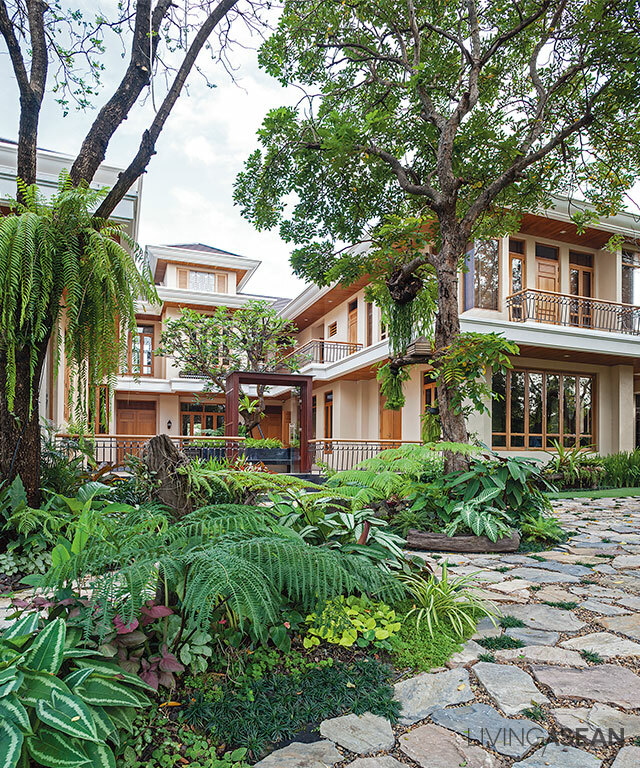 Owners, Aphiwat Wiriyawetchakhun and Phanison Anansuchatikun assigned Suphakit Milap of Sukyen Garden to design a garden to suit their beautiful house, and this is the result. 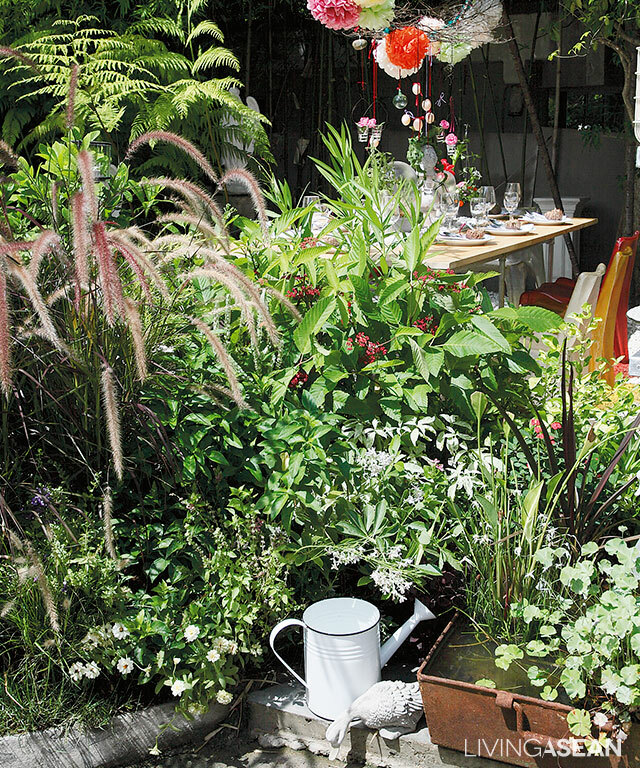 Creating a string of small circles of plants of differing heights for a remarkable effect. 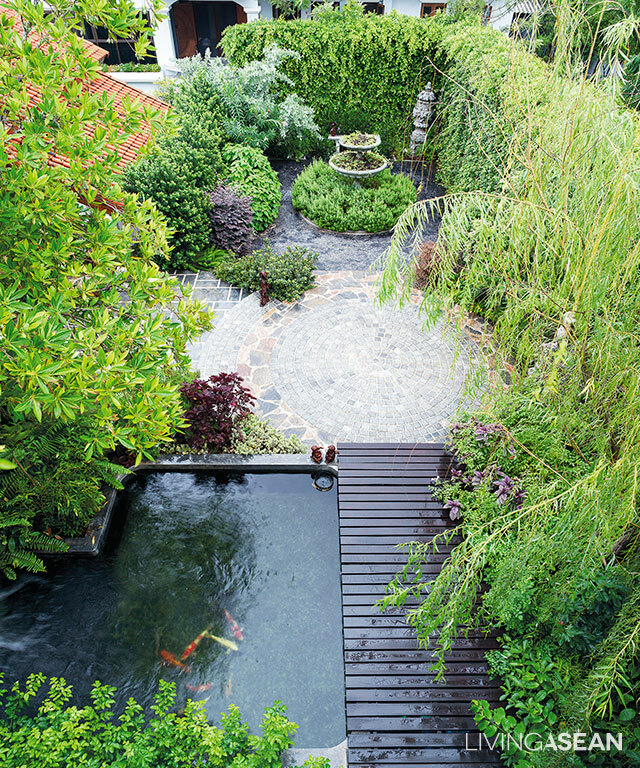 Though a lot of hardscape is used, the choice of plants and their placement make the garden look quite natural. 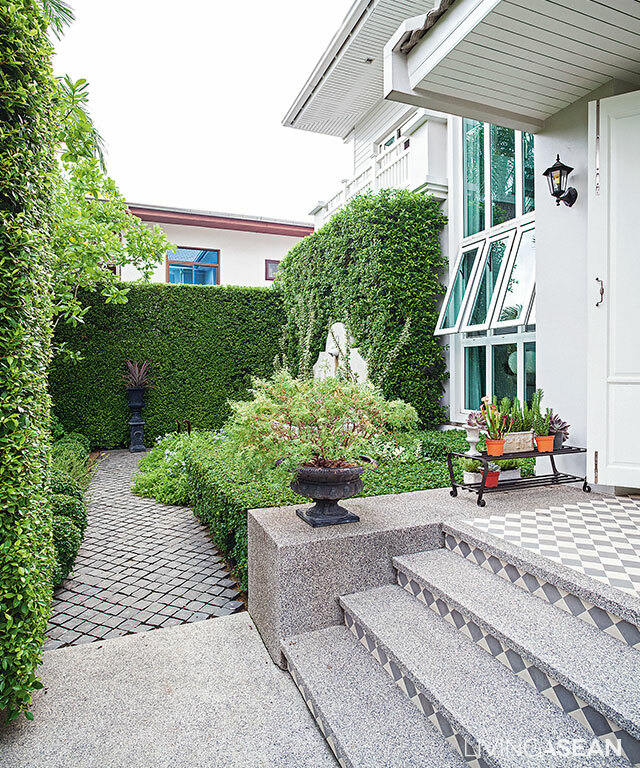 At first, I thought of doing Chinese style, flowerpots and planters because we like the Chino-Portuguese look, but we’d bought a lot of Western garden ornamentation from the GEO store before we were married. 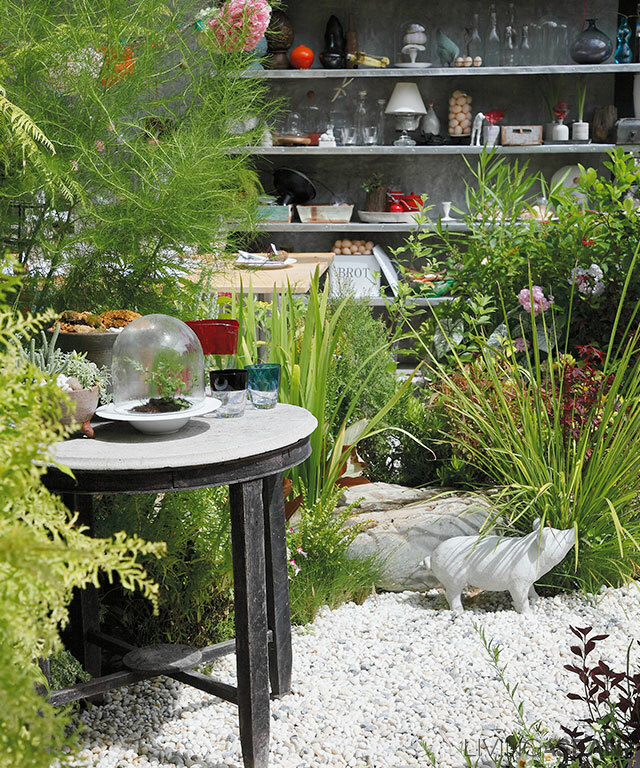 Suphakit saw it and said we should use this.” Plants were found to match, and the garden took on a vintage atmosphere resulting in a pleasant English garden flavor: a two-tier bird bath, concrete benches, and so on. 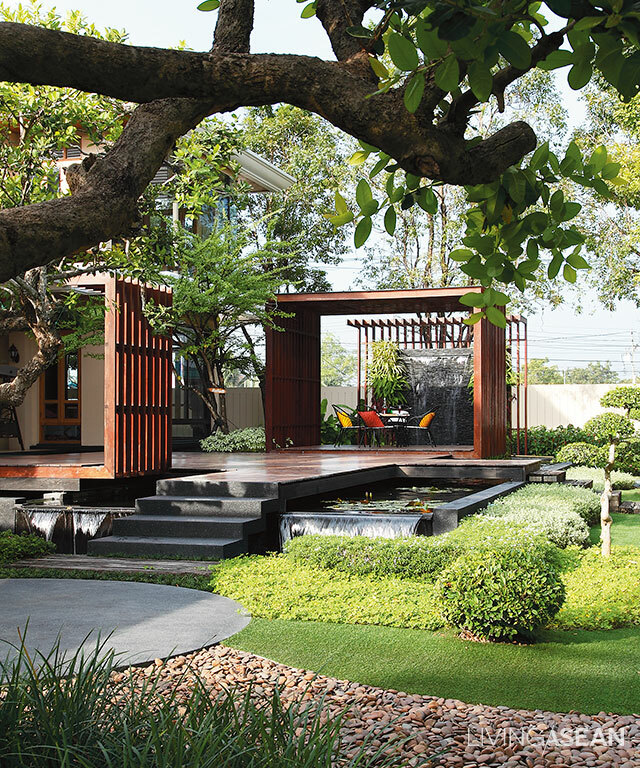 The garden follows the L-shaped form of the house and is organized into two parts. 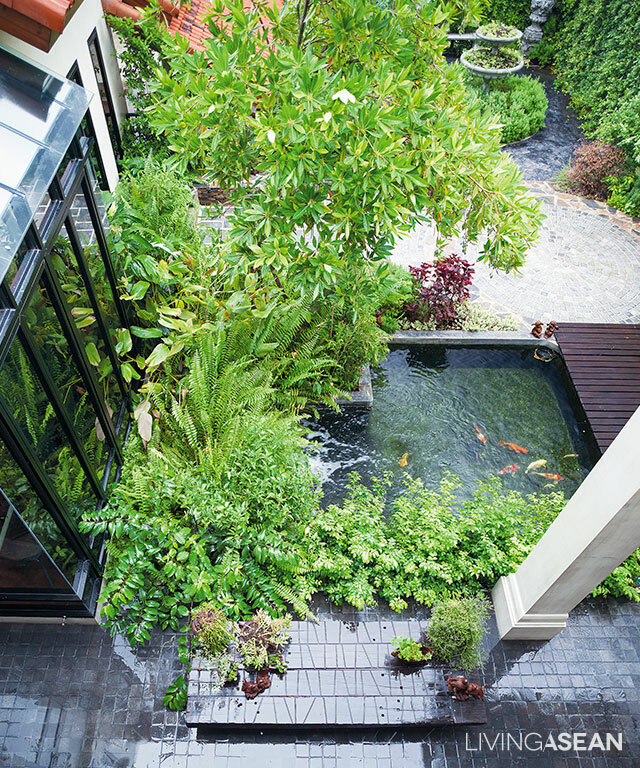 Placing the pond by the tall windows creates a great garden view for people looking out. “From this room both sections are visible. 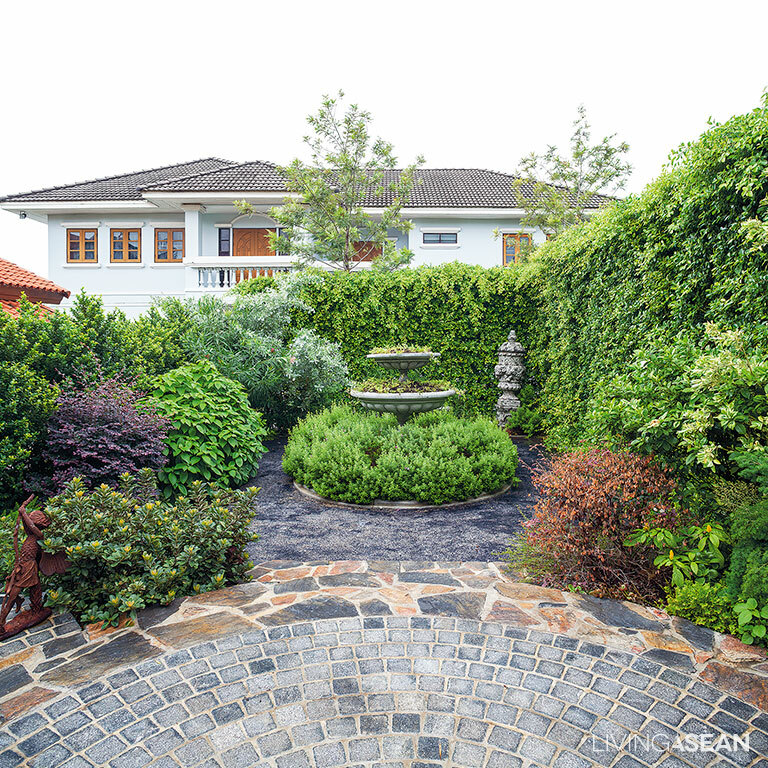 The owners wanted a kind of “secret garden” with a lot of privacy, hence the banyan hedge. They also wanted an orderly looking garden, not busy, so I used a formal design. In front and back, you’ll see a lot of connecting rectangles, with focus points in the center, using conservative colors and materials such as cobblestone, natural rock, and washed gravel divide areas of use. Cute figurines from the owner’s collection welcome the visitor coming up to the house. 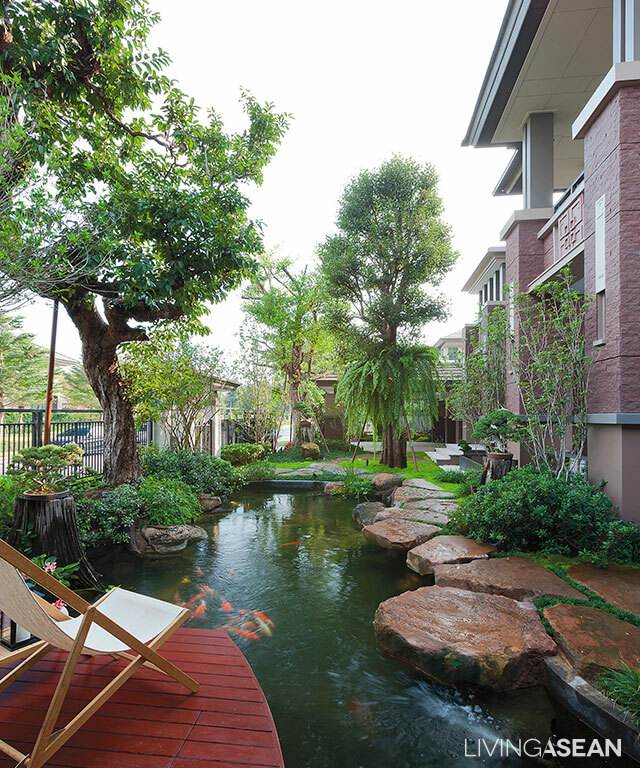 /// Medium-sized carp pond adds a pleasant feeling. Little courtyard tucked away with plants grown behind a little stone wall just high enough to sit on, for an English flavor. 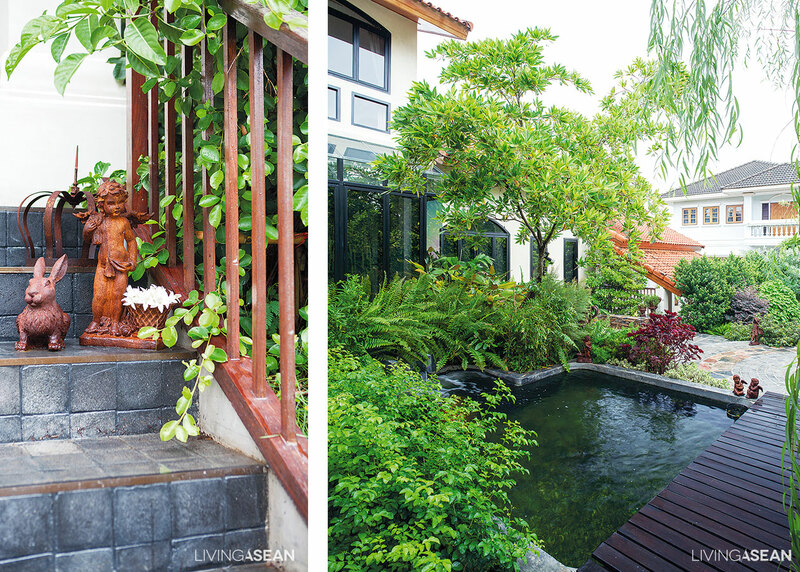 Leaves of red mixed with shades of green give dimension to the garden. 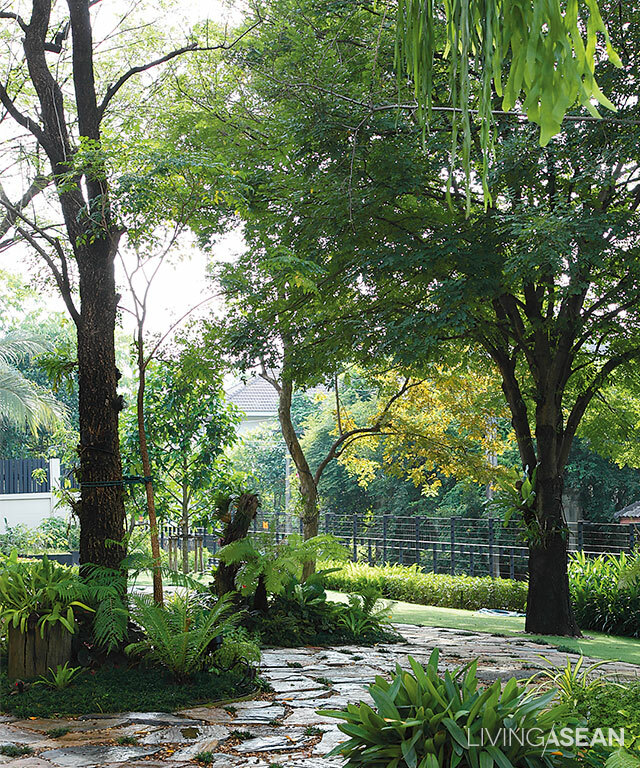 The garden with its many fresh shades of green is enclosed by banyans, very private. 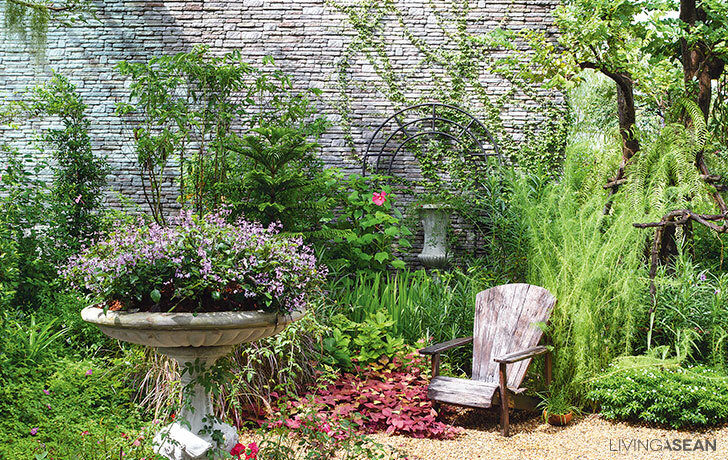 Stone planters create borders for an orderly beauty that remains natural. Each section has a circular focus point. 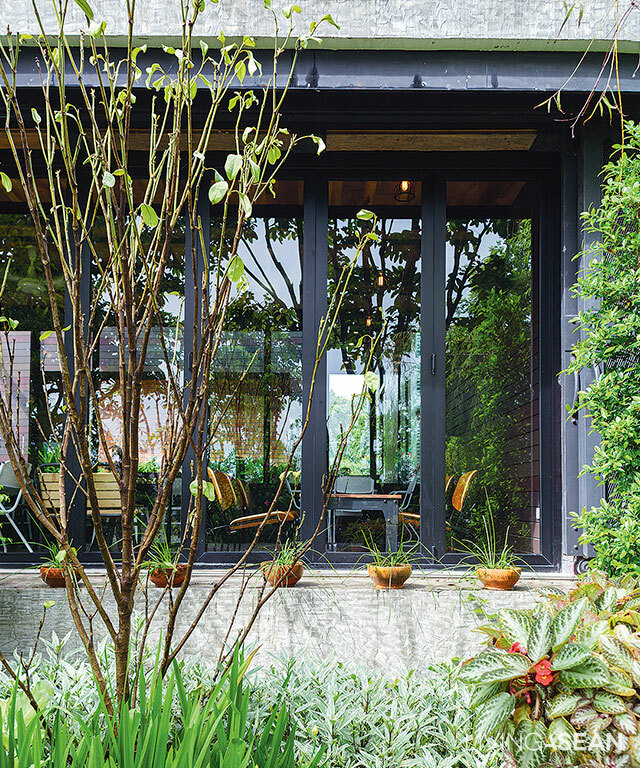 The area by the street is a more simple yard and includes growing kitchen vegetables for home use. 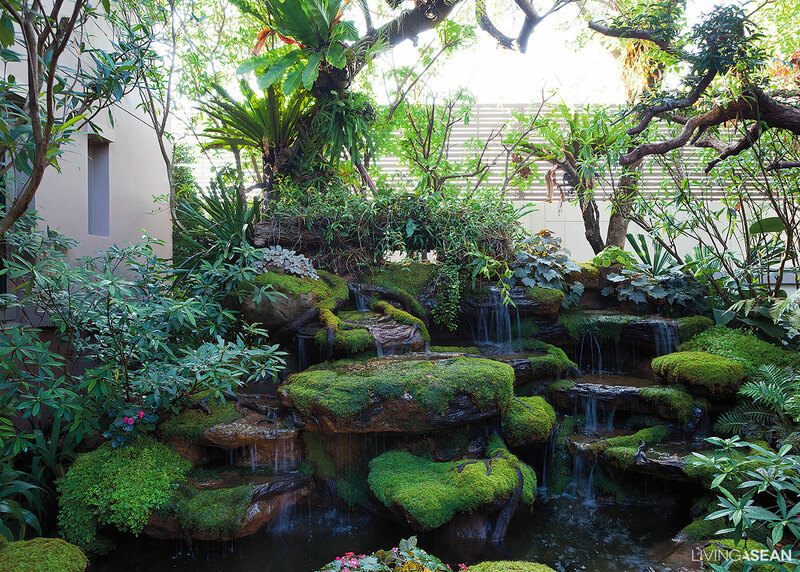 The back garden is much more elaborate, with a little waterfall, seating, and an elaborate hardscape. This spot is accessible from the living room; placed the table here for easy use. 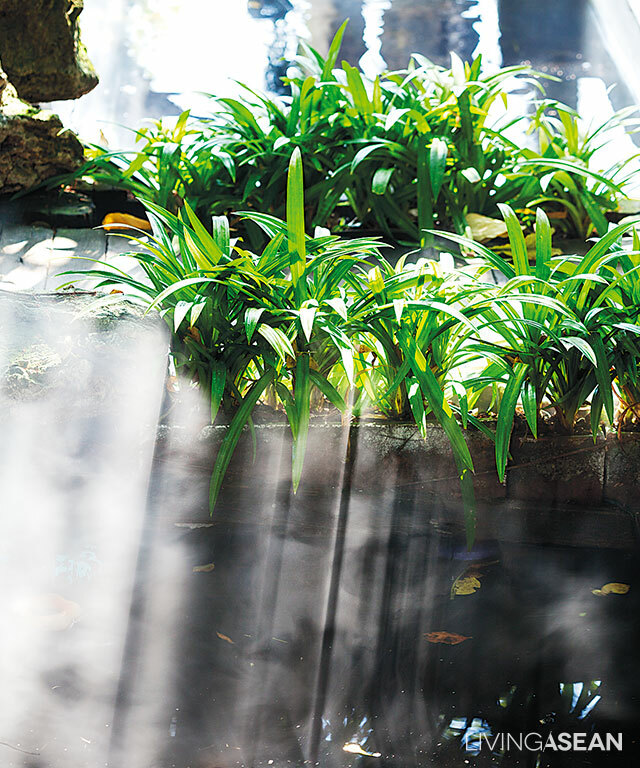 Maintenance is fairly simple, with an automatic watering system. The owner’s mother also comes to help. 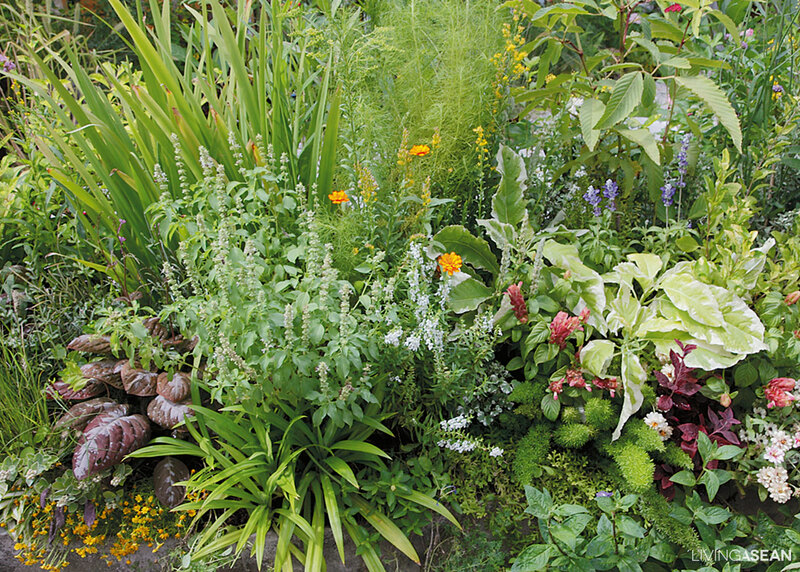 “This garden has made the house so much more pleasant and comfortable – who would have thought? It feels like the fulfillment of a heart’s desire,” Phanison tosses off at the end. Concrete bench in among the plants for a pleasant hideaway. Happiness can be a cool breeze in the morning and a cup of coffee with pastries while listening to the sound of flowing water to a counterpoint of a birdsong. 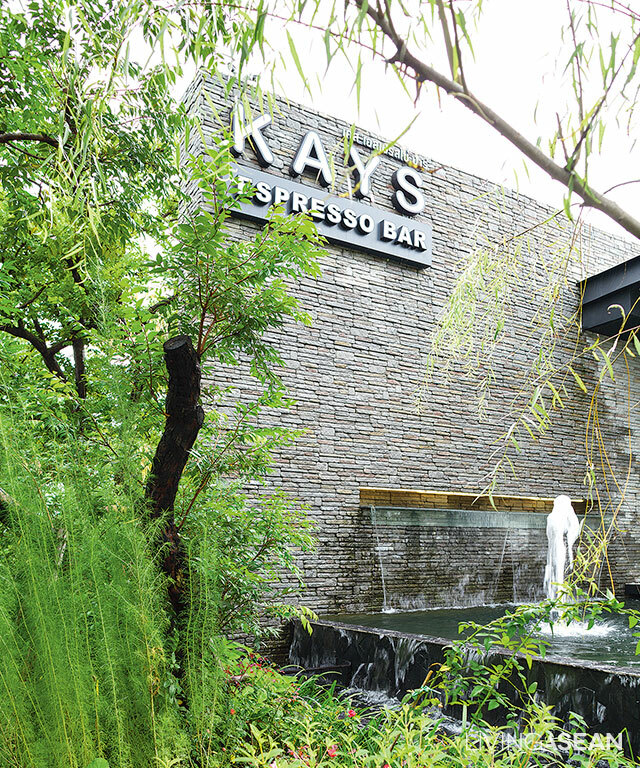 This is the experience offered at Kays Espresso Bar, a new cafe in Chanthaburi Province with a scent of coffee in the garden. 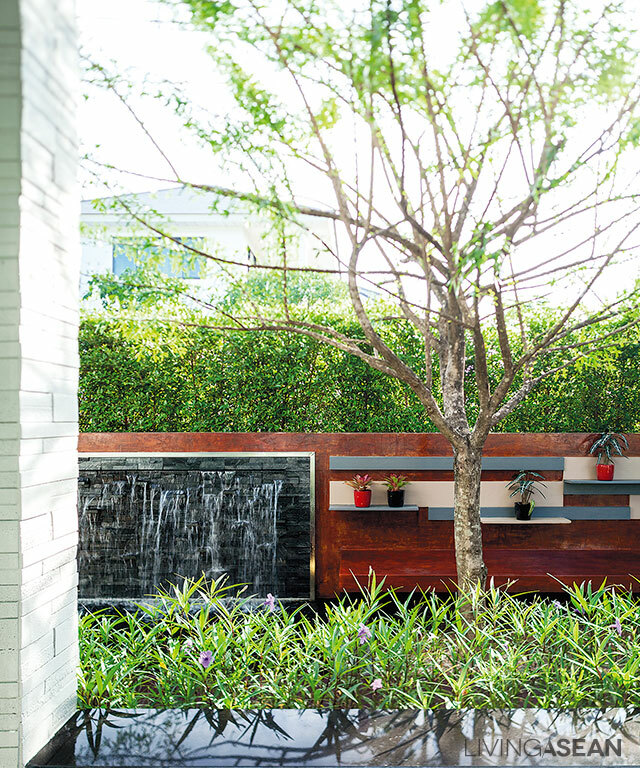 A decorative waterfall gives life and motion to the garden. On the stone wall above is the shop name. 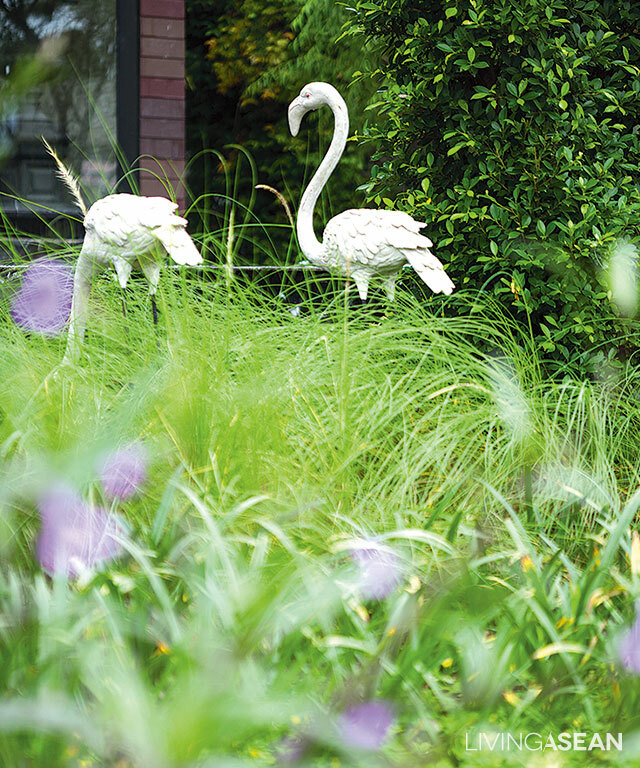 Ecology of nature: flamingo figures in fountain grass, fishing at pond’s edge. 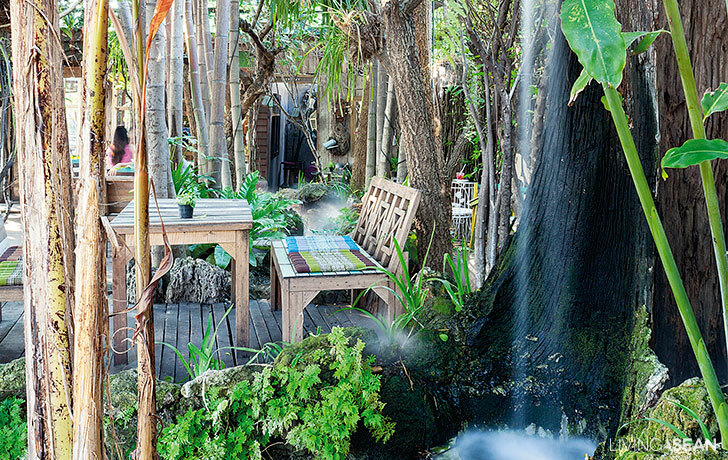 One of the garden highlights at Kays Espresso Bar, perfect choice and placement of plants and ornamentation. 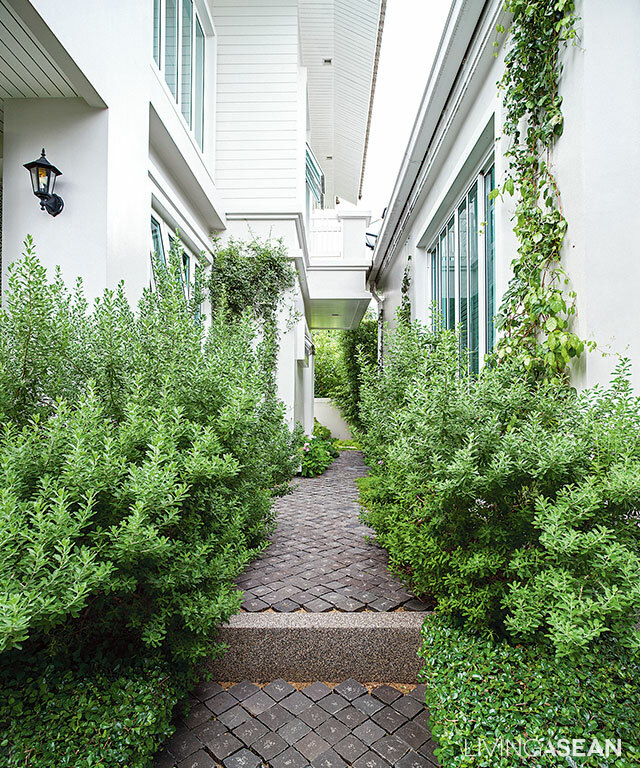 Freeform red flagstones trace a path from front to back. The river gravel is easier to maintain than grass. 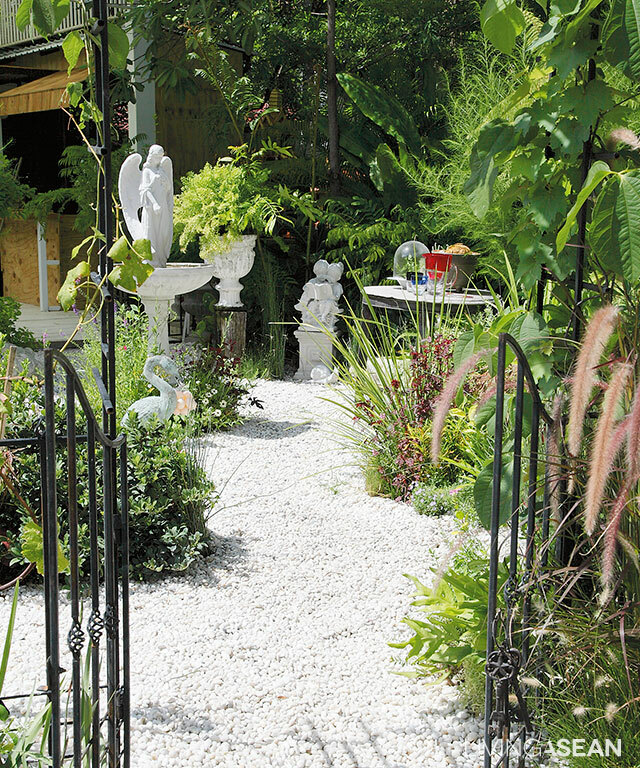 Vegetation of varying height lines the path past a birdhouse and an urn-shaped planter. Sak took the challenge and delivered as ordered, even if there were a few problems to deal with. “The first time I saw the worksite it looked like a desert, but somehow we managed to turn that around. The first problem was the clay topsoil, sticky and tightly compacted. We broke shovels digging, had to switch pickaxes. The good thing was that the ground didn’t absorb too much water, and wasn’t about to collapse. 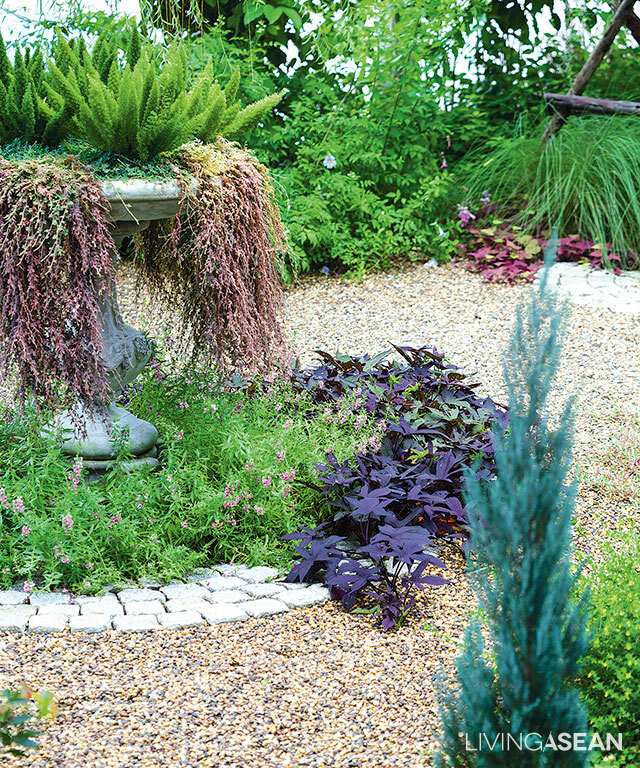 English-style bird bath planted with asparagus fern, spikemoss hanging below. 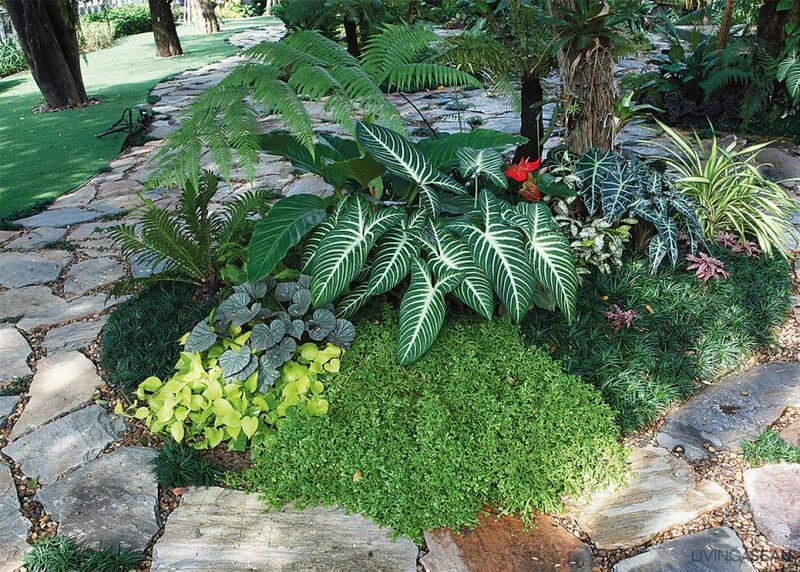 A ground cover of varicolored leaves and flowers makes this a striking spot. 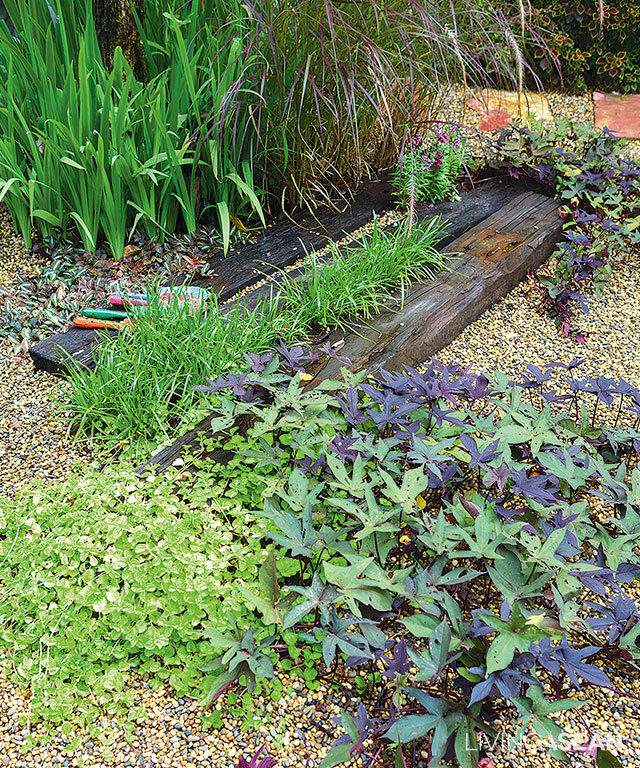 Railroad ties laid down decoratively with ground cover plants growing over them. 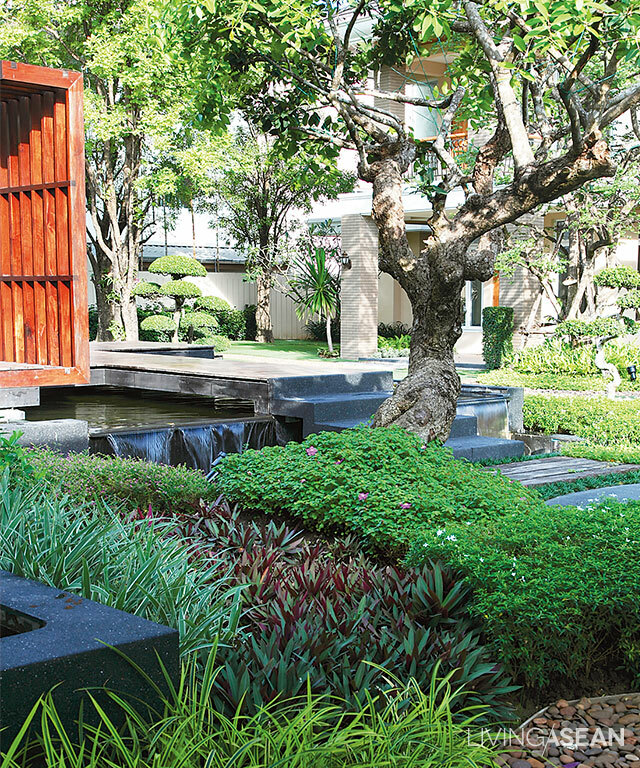 The hardscape includes the large metal fountain in a modern style to match the building, with a pond and waterfall. Further on is a metal frame gazebo, and then a big rust-colored faucet set in an upright hollow log. 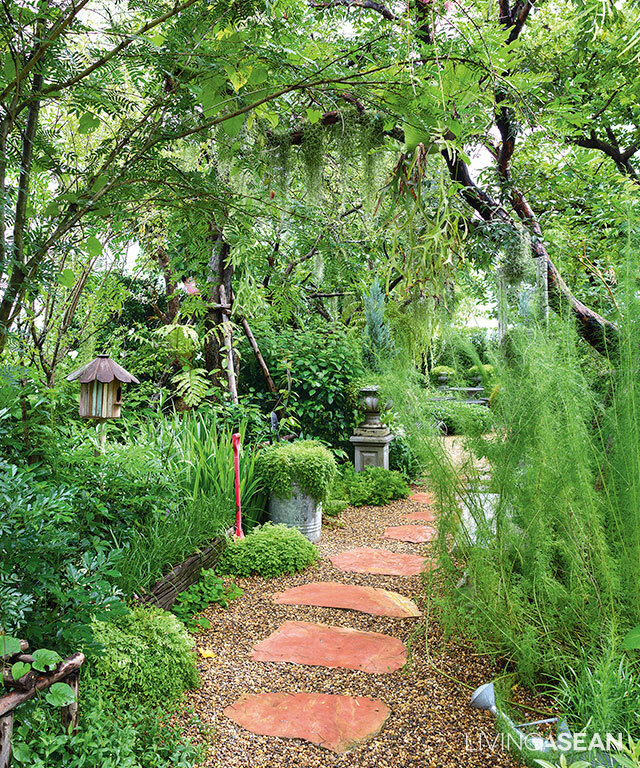 A flagstone path of red sandstone runs throughout the garden. Beautifully designed lion’s head above a faucet. If you wash hands here the water falls on a clean stone surface, no mess. 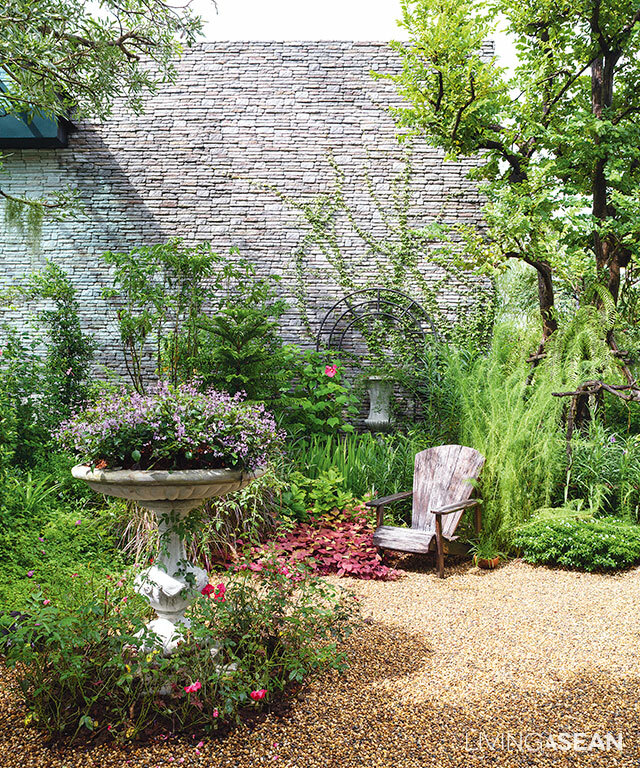 Old benches are set in the back, by a gray wall covered in climbing vines, with bright ground cover colors and a bird bath planter filled with beautiful flowers. English-style chairs are found in various shady spots. 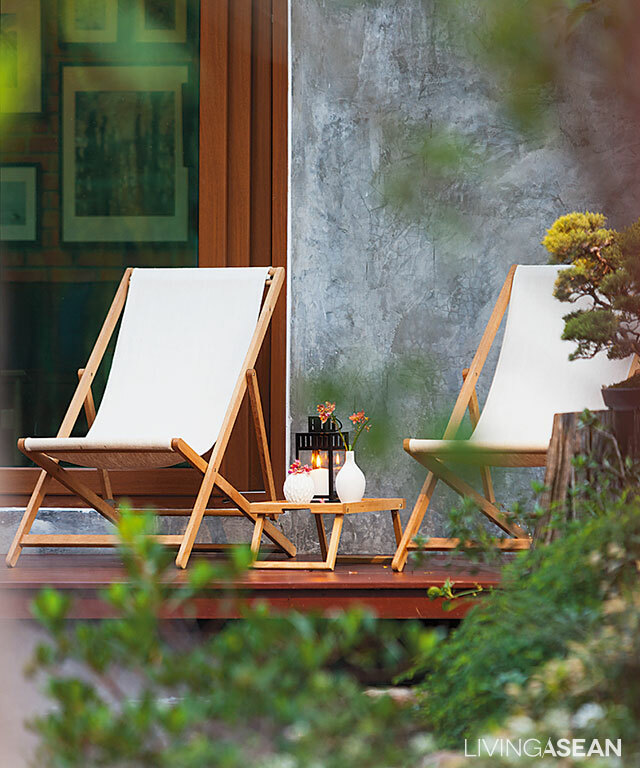 English-style lawn chairs for enjoying tea and coffee outside. Arbor and back entrance gate, with a cobblestone walkway. 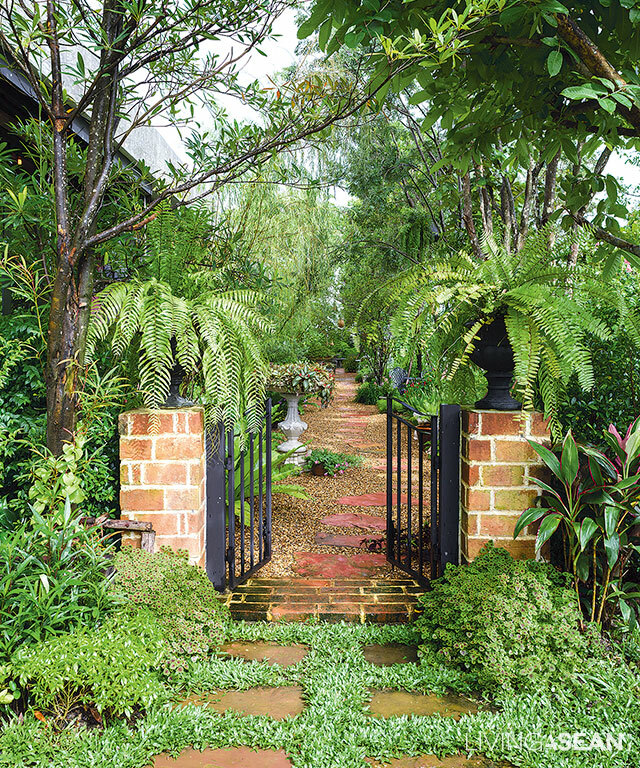 Urn-shaped planters at the entrance show off the English garden style. 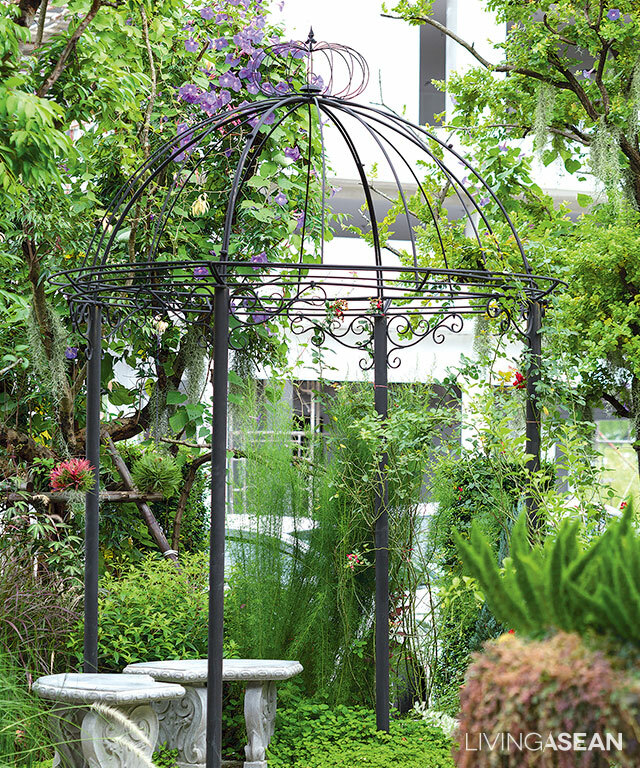 The owner especially loves this arbor, with its curved benches set on round cobblestones. 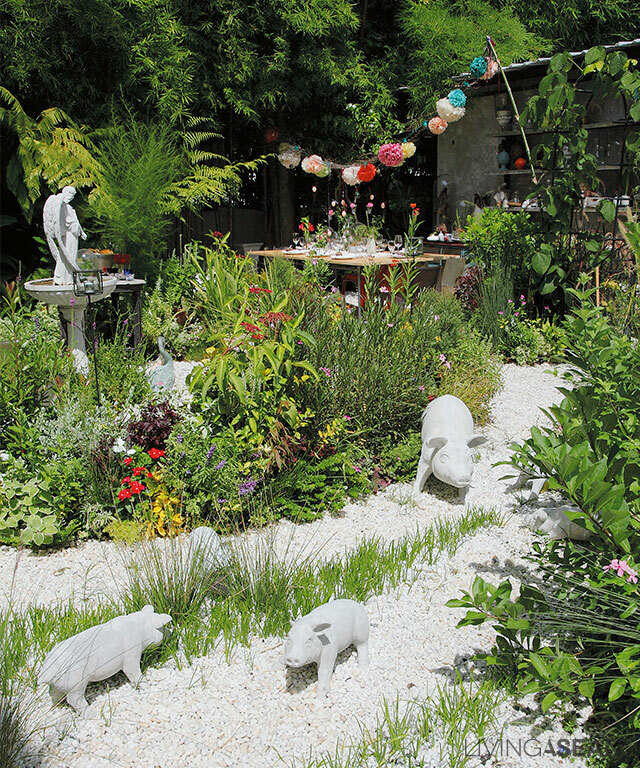 Here is a shop owner who loves sharing nature with his customers, and with the animals who make their home in the garden. 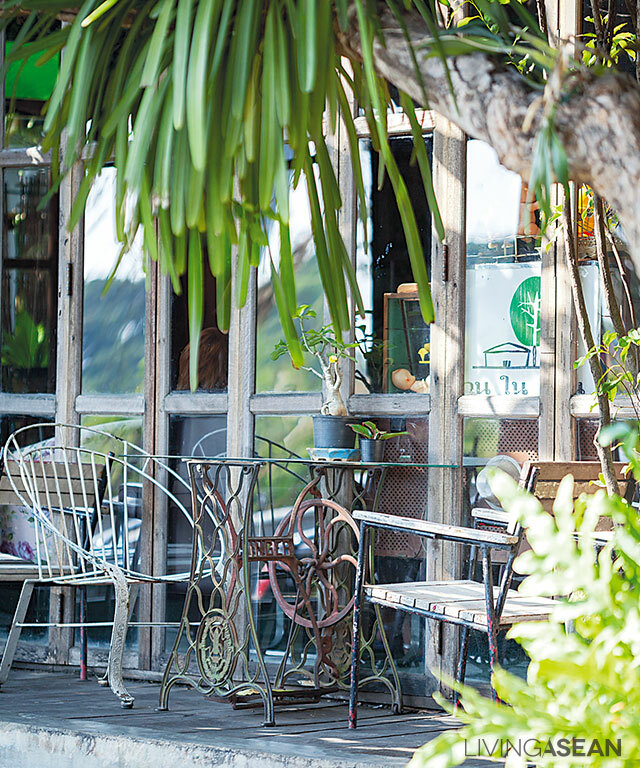 For a taste of this happiness, stop in sometimes at Kays Espresso Bar, on Yanwirote Road right in Chanthaburi. We guarantee you’ll get hooked. 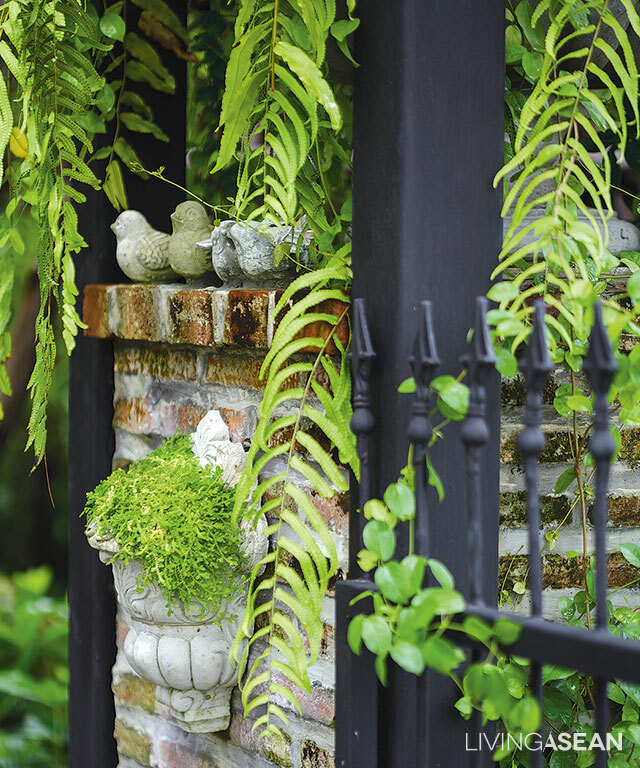 Arbor frame over a decorative brick column, with a hanging planter and cute bird sculptures. 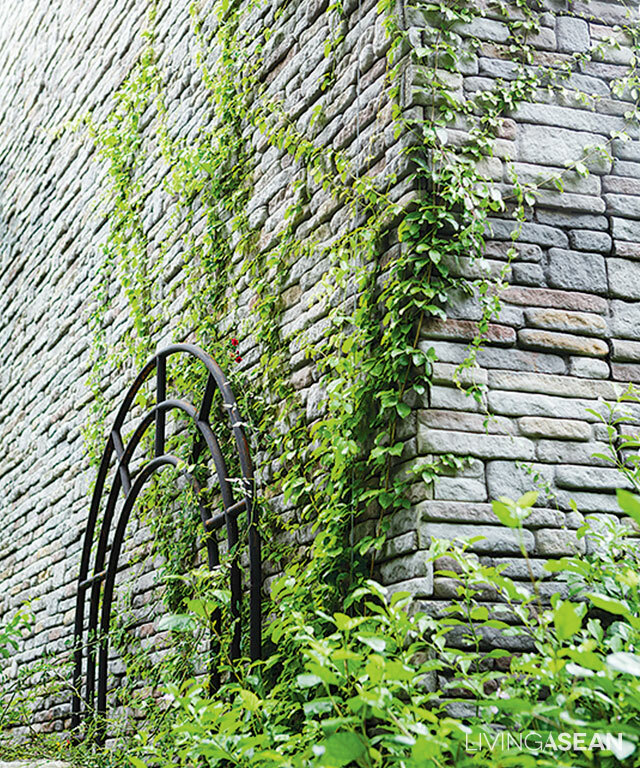 Cats claw vine climbs the decorative wall, reducing the harshness of the stone and bringing the garden closer to nature. 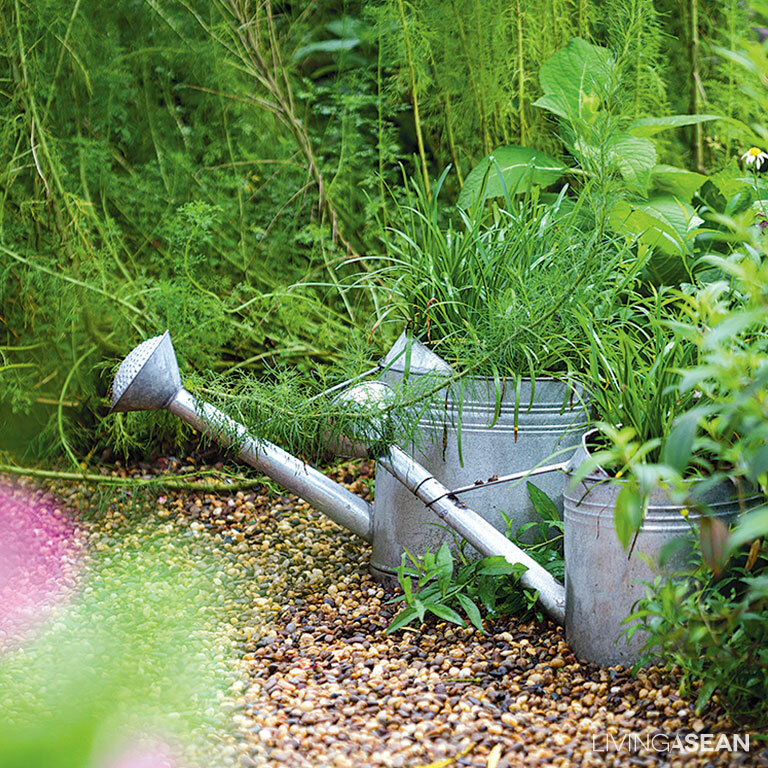 A cute use for old watering cans: turn them into planters.